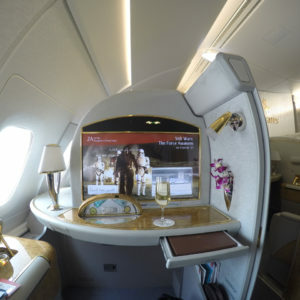 Emirates first introduced their Airbus A380 in 2008 with nonstop service from Dubai to New York. 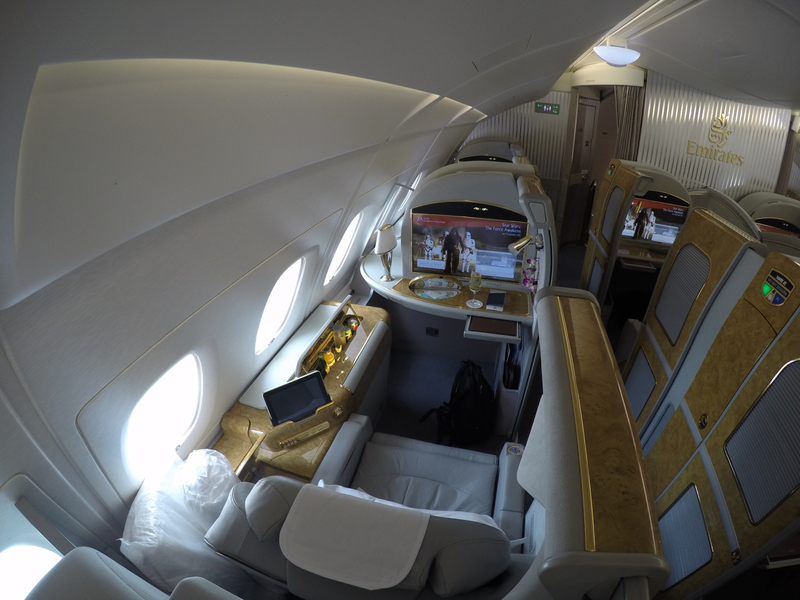 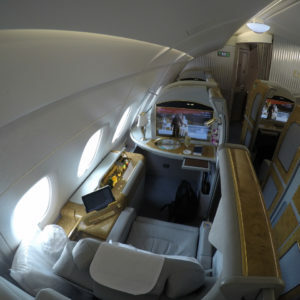 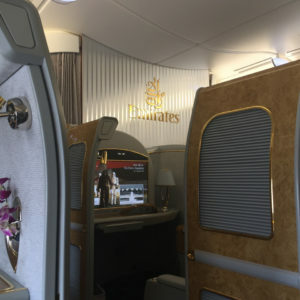 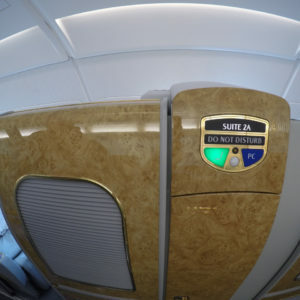 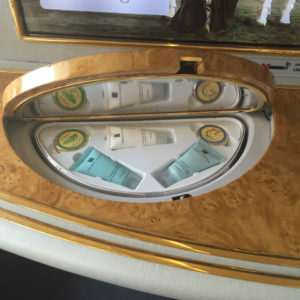 They’ve been known for having a very flashy cabin which includes gold to show the wealth of the UAE. 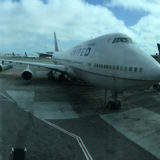 It’s been on my bucket list of airlines to fly and I finally had the opportunity a few months ago. 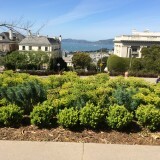 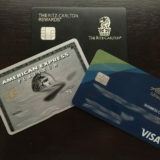 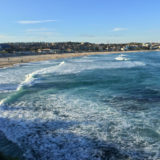 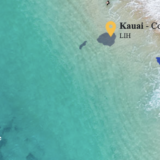 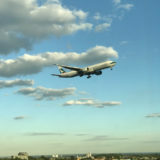 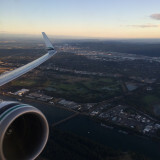 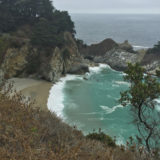 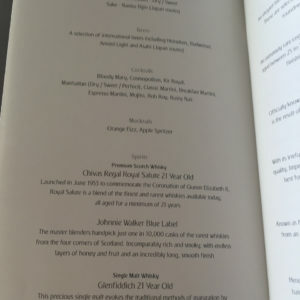 I booked the flight in First Class using 100,000 Alaska Airlines miles and $90.30. 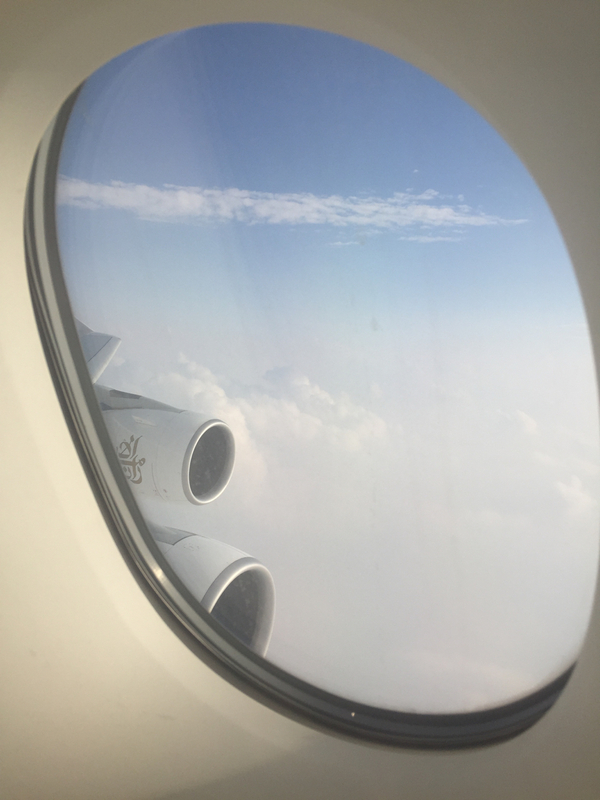 There was a last minute aircraft change therefore I was only able to enjoy the A380 on the Bangkok to Hong Kong and Hong Kong to Dubai legs of the trip. 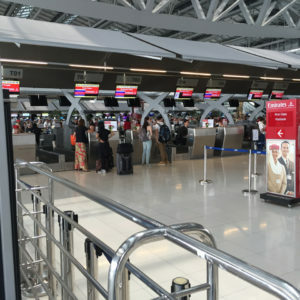 After stopping for a night and dinner with my local friends in Bangkok, I headed to BKK via GrabCar (Uber competitor in Thailand). 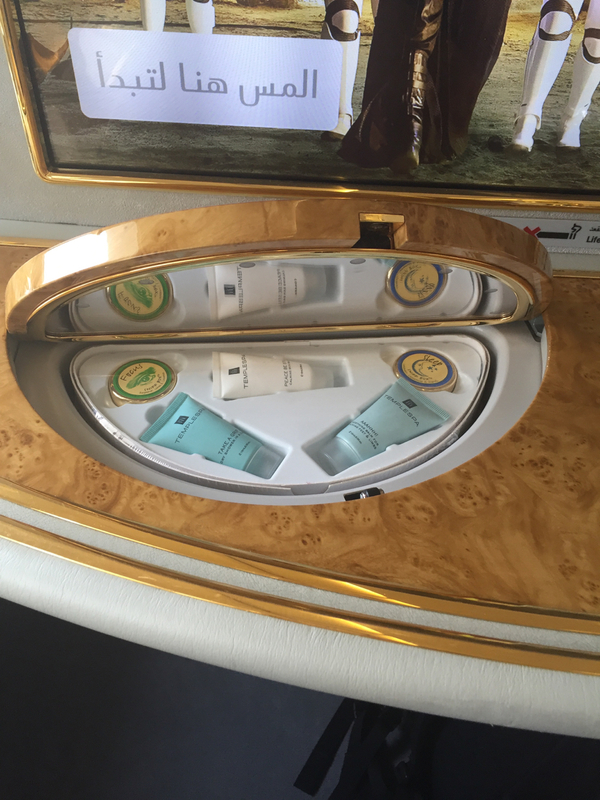 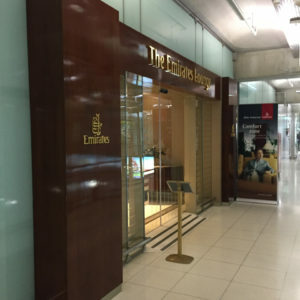 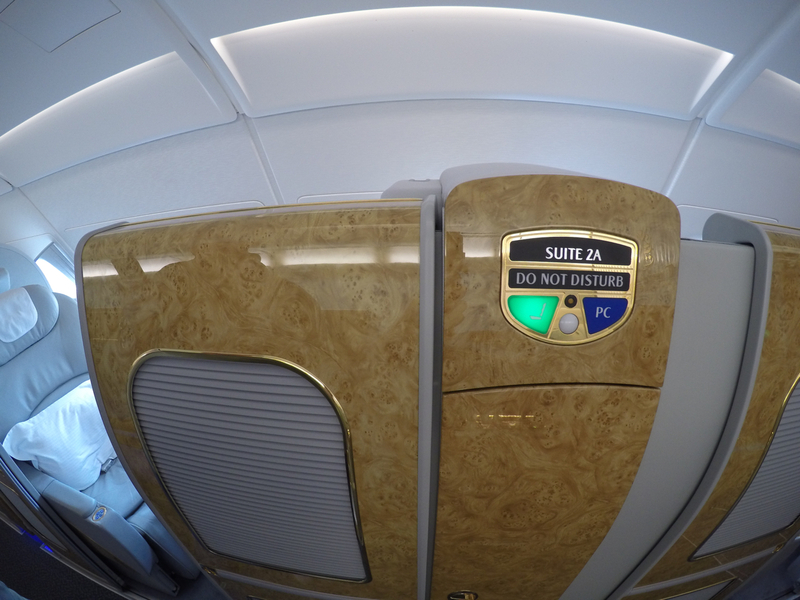 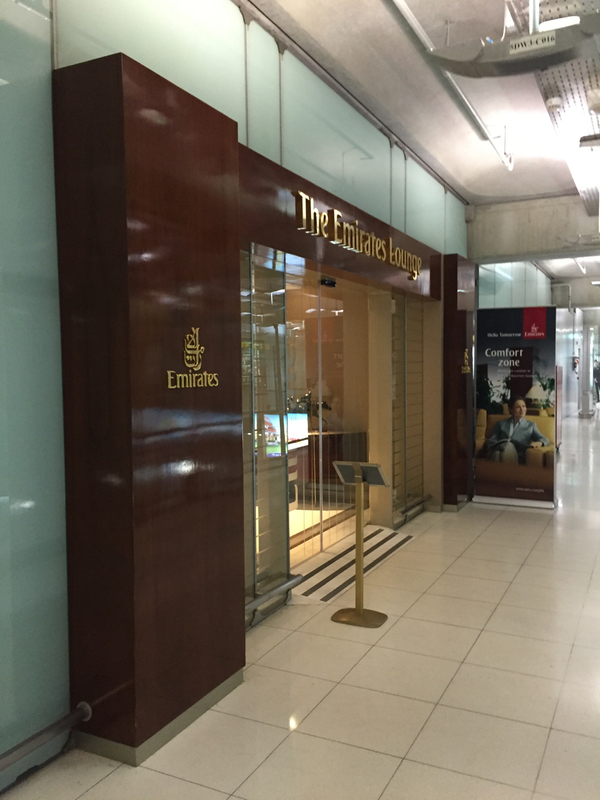 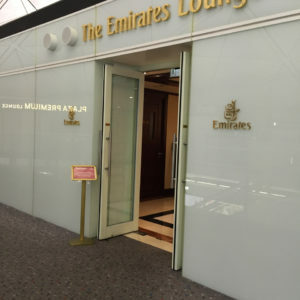 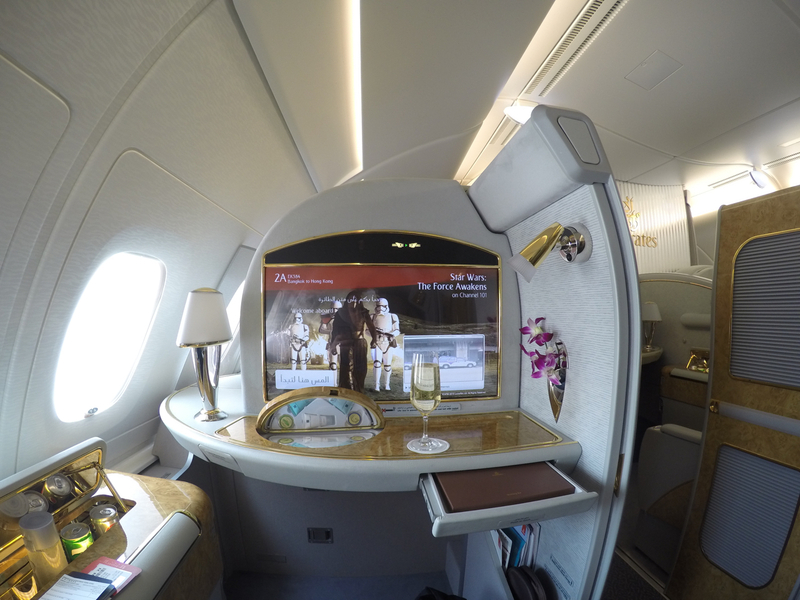 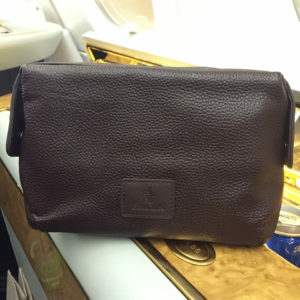 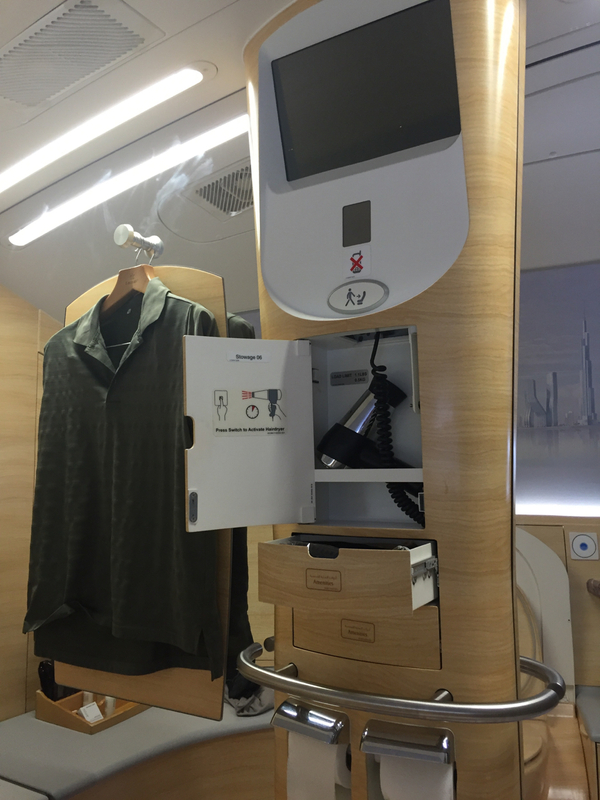 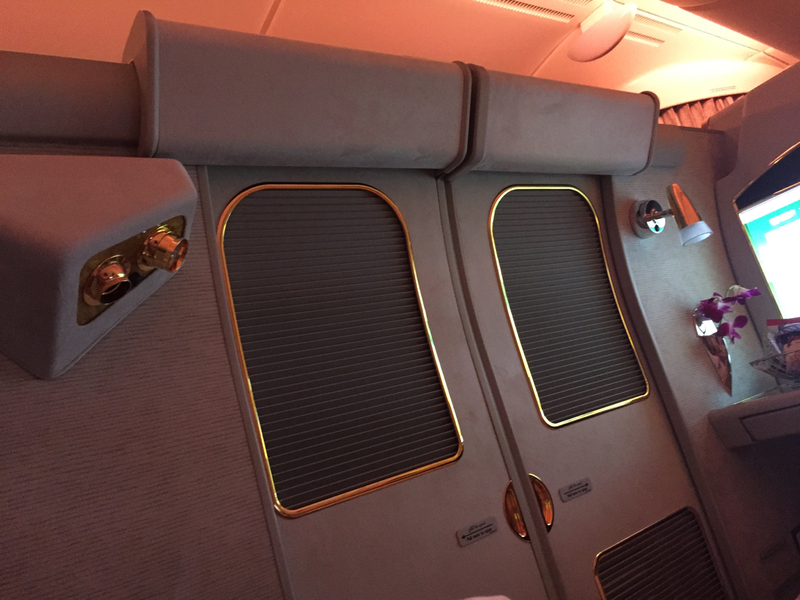 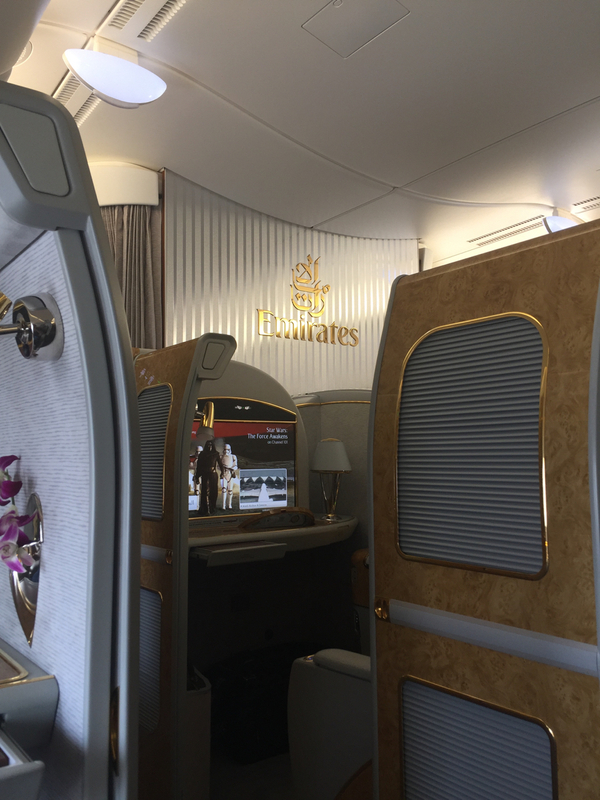 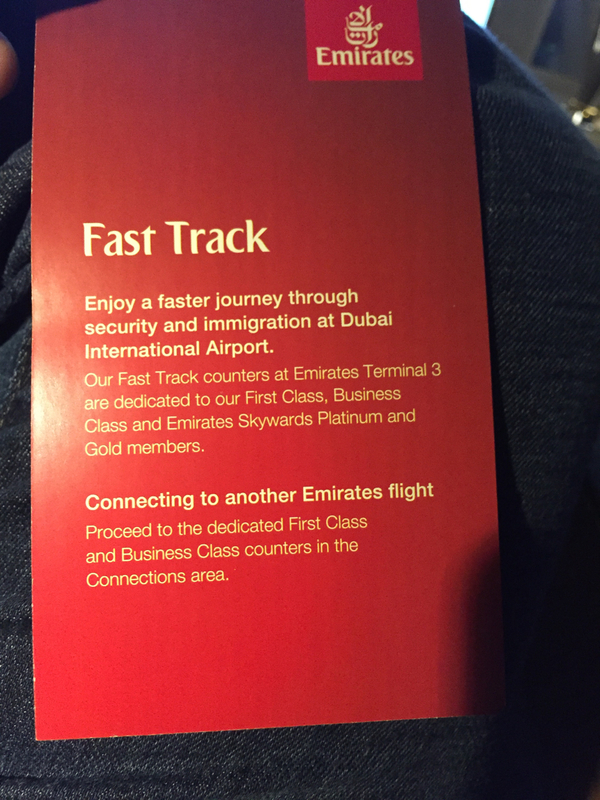 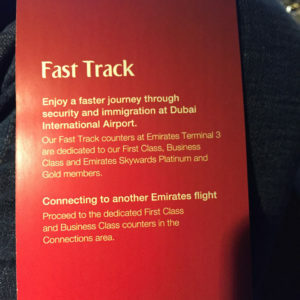 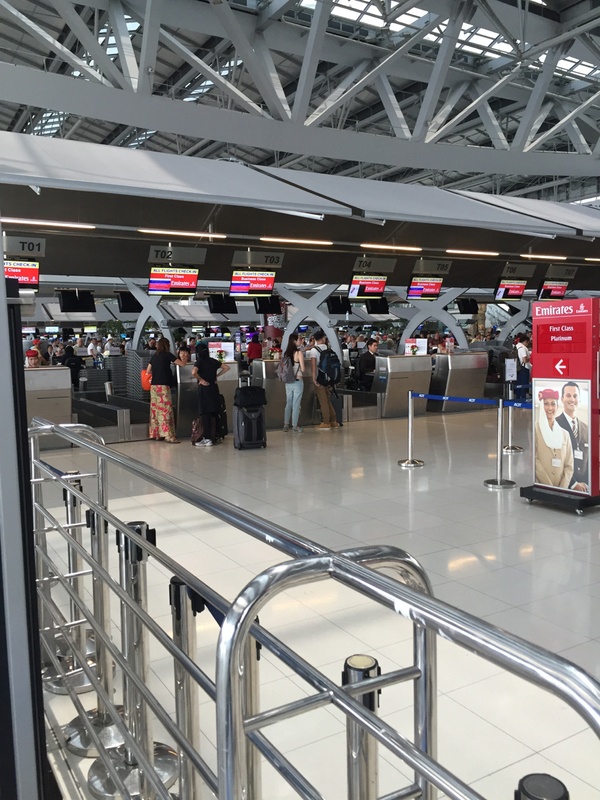 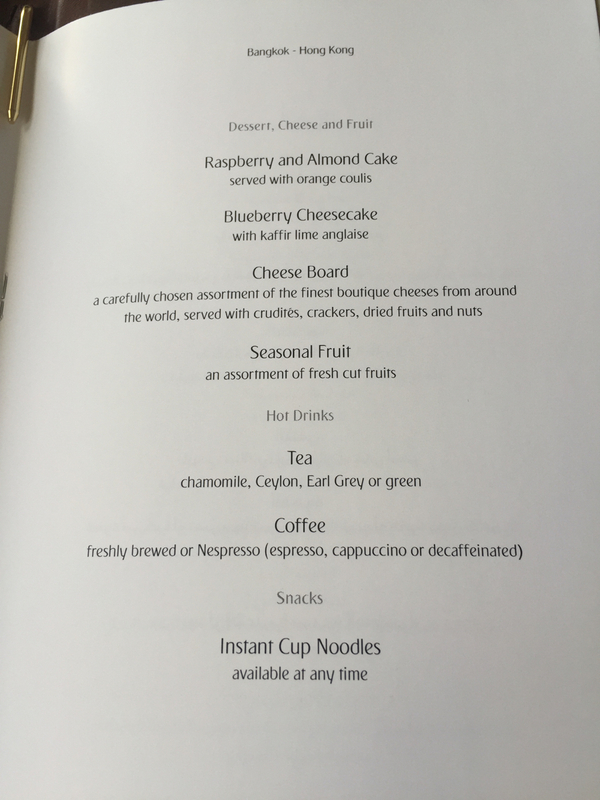 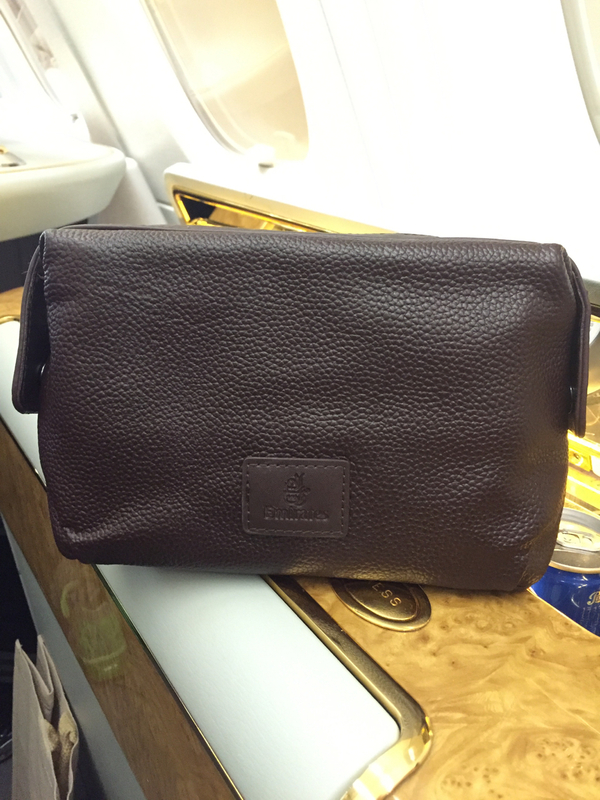 Upon arriving, I headed to the First Class checkin for Emirates which was easy to find. 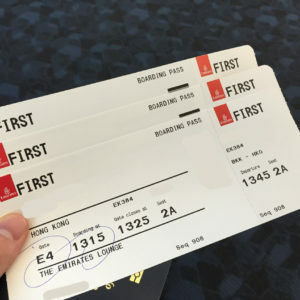 The agent printed all 3 boarding passes for my ticket and included the Premium Lane pass which helped bypass the long security and immigration lines. 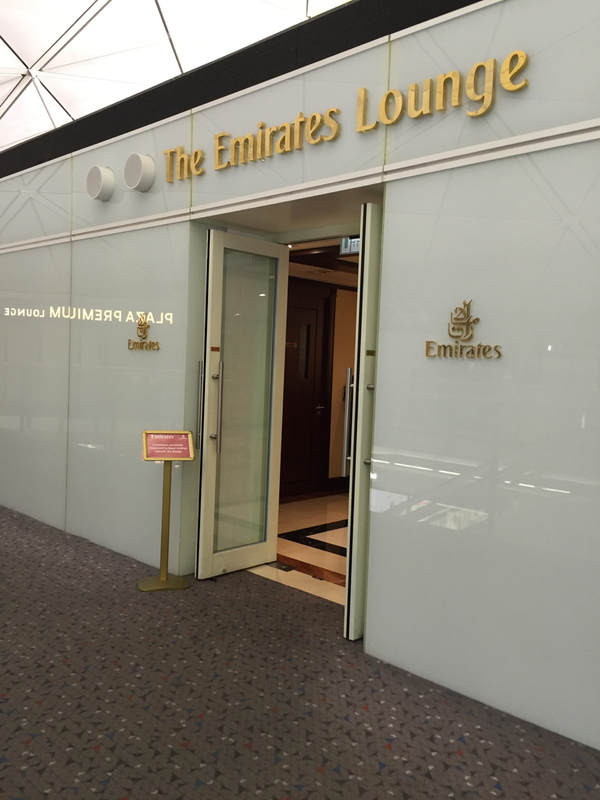 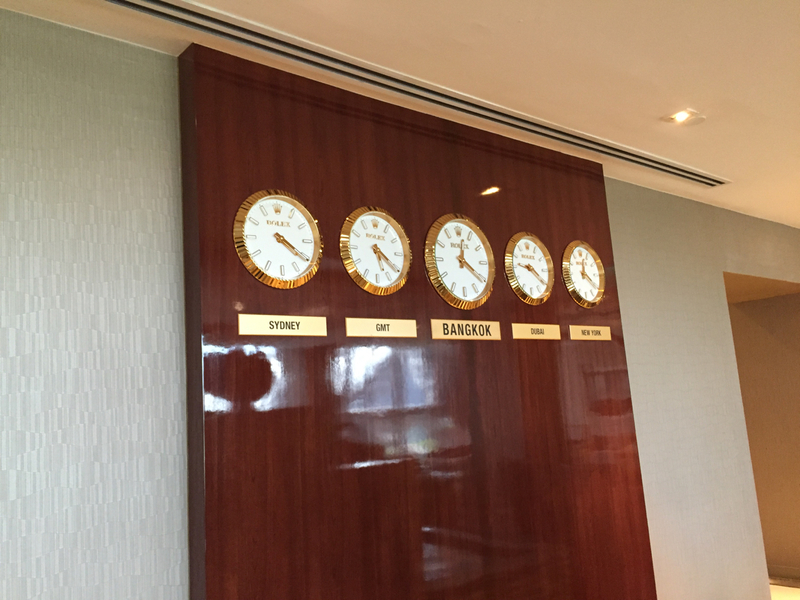 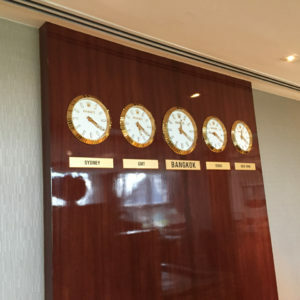 The Emirates lounge in Bangkok was nicely decorated and included some Thai food. 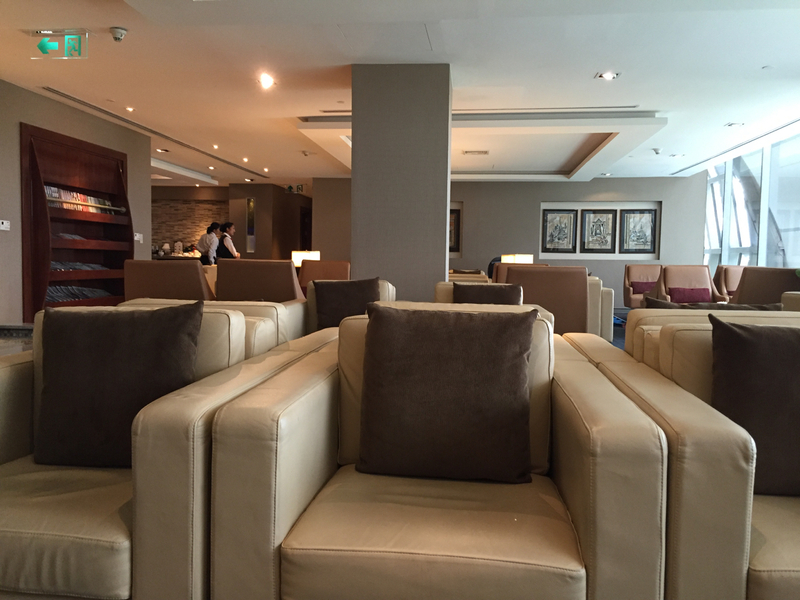 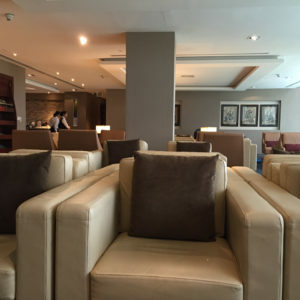 The lounge was filled with mostly Business Class passengers and when our flight was called it quickly cleared out. 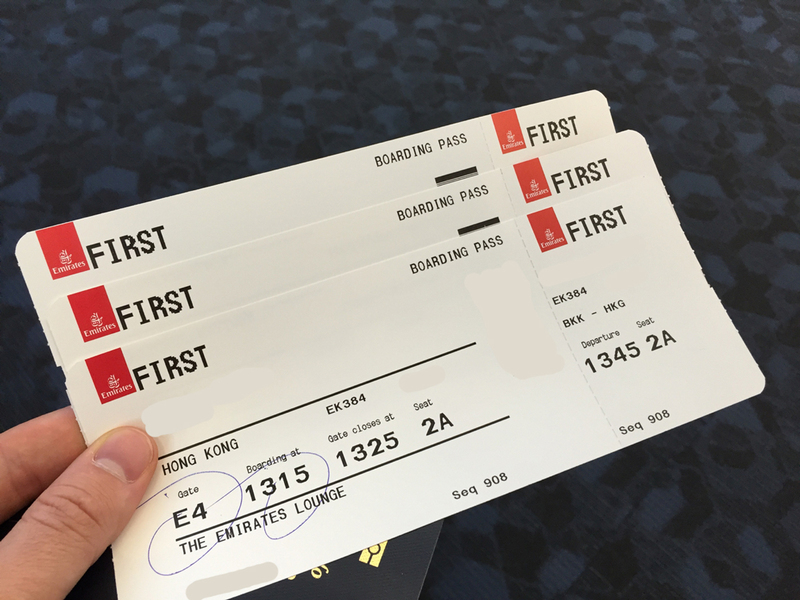 Boarding commenced on time and off I went to the upper deck of the A380 to find my seat, Suite 2A. 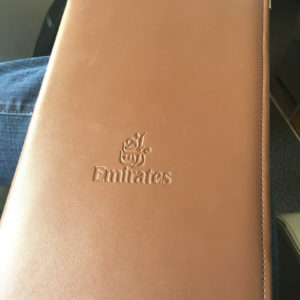 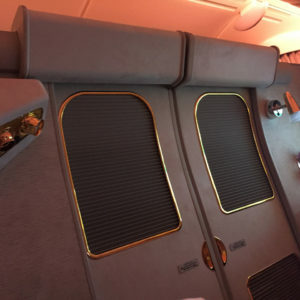 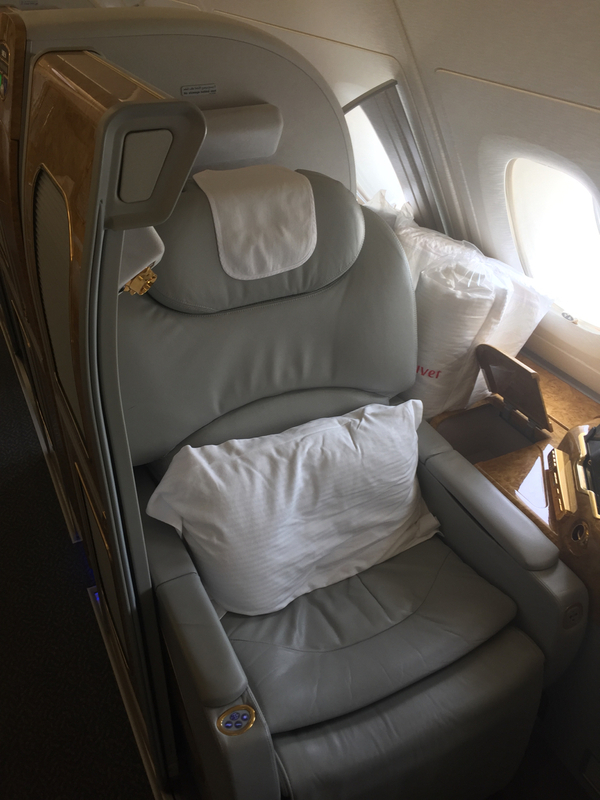 After getting situated and securing my carryon luggage (using a seatbelt… see the photo below), I was offered a date and arabic coffee which is customary on UAE-based carriers plus champagne to celebrate. 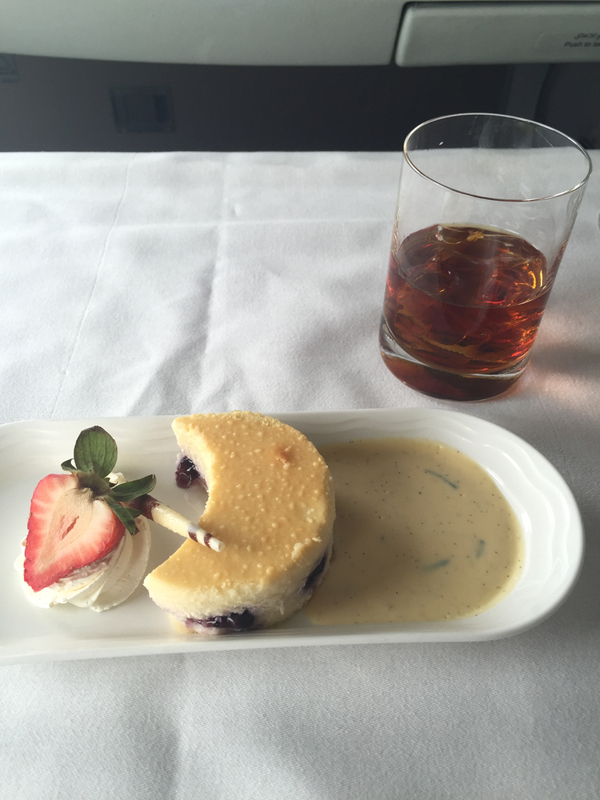 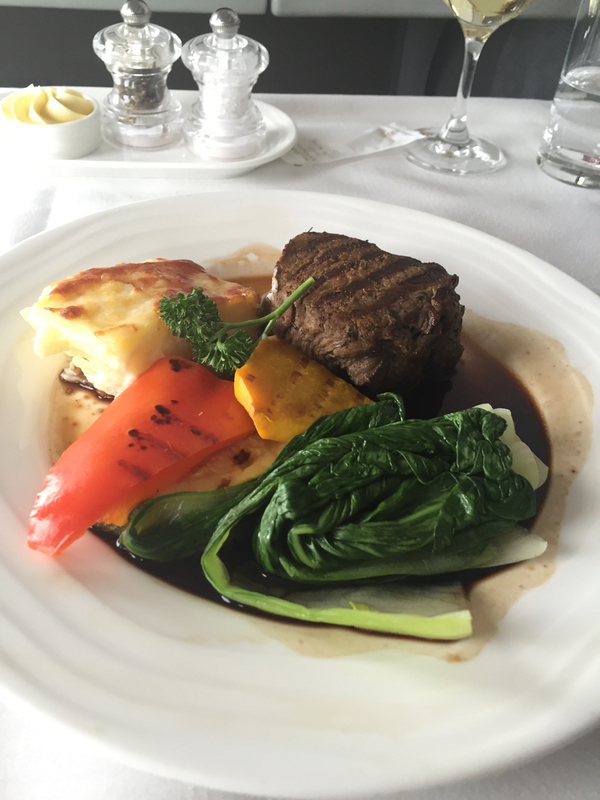 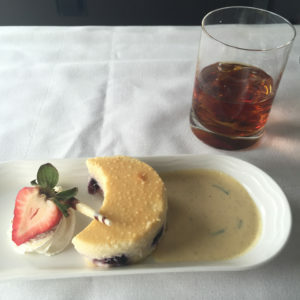 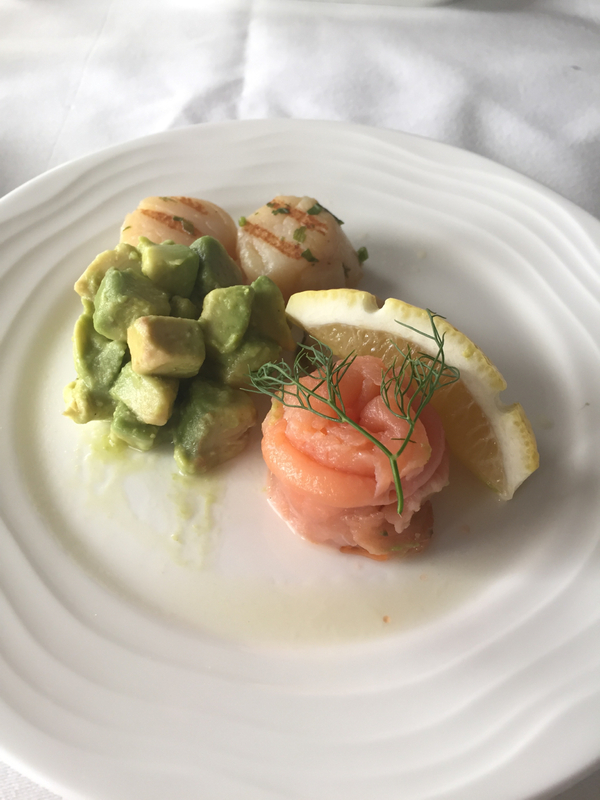 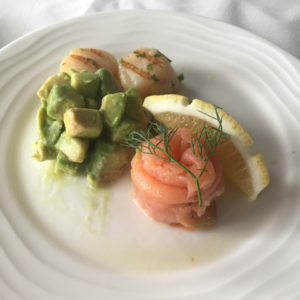 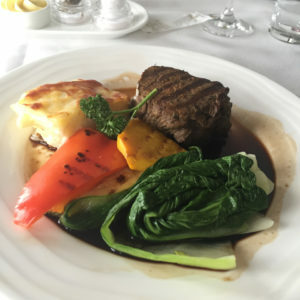 This was a daytime flight so lunch was served right after takeoff which I opted for Seafood Duo, Grilled Fillet of Beef and Blueberry Cheesecake. 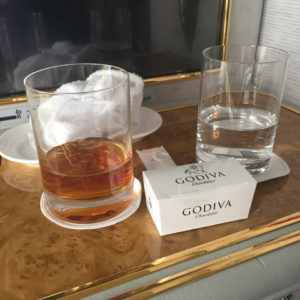 The food was excellent and finished it off with Godiva chocolates plus a glass of Hennessy Paradis (~$1,000/bottle)! 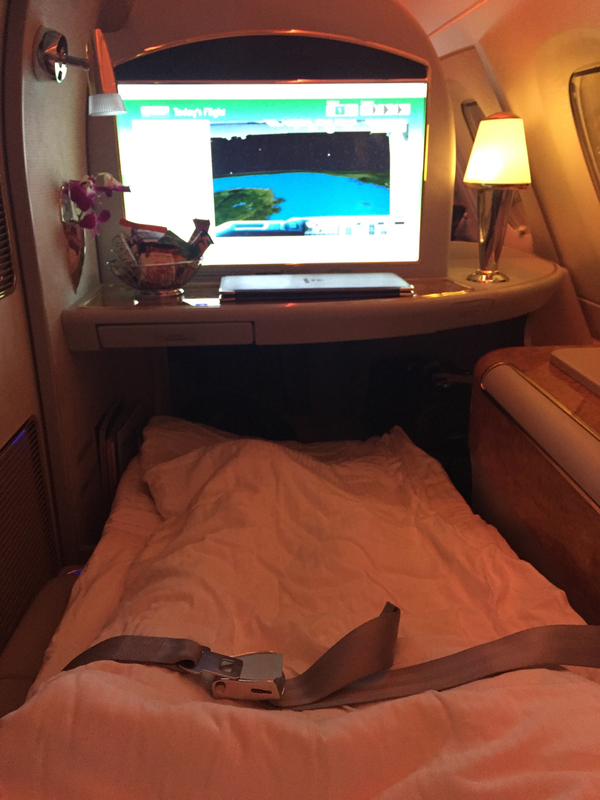 I was even handed PJ’s for this short flight which I packed away for use at home. 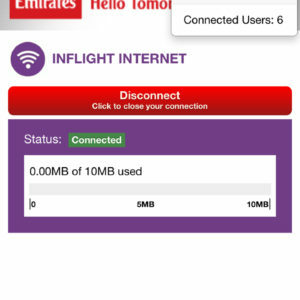 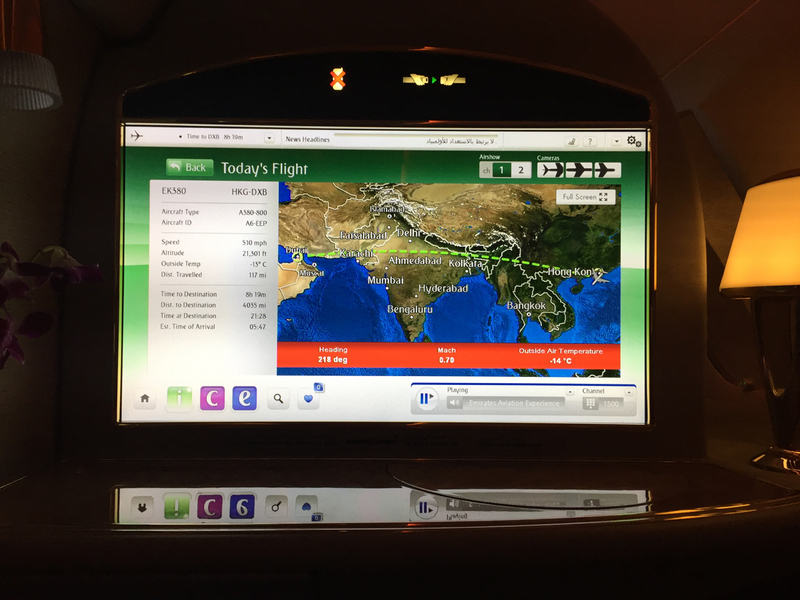 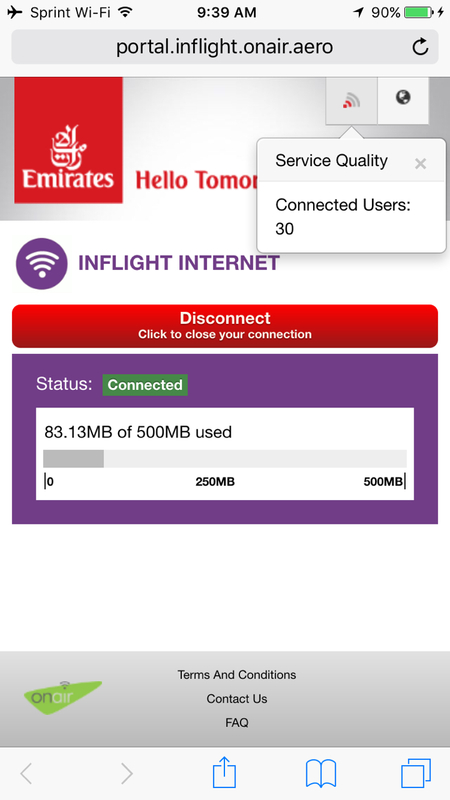 On every A380 they offer WiFi service and include 10MB of usage at no charge. 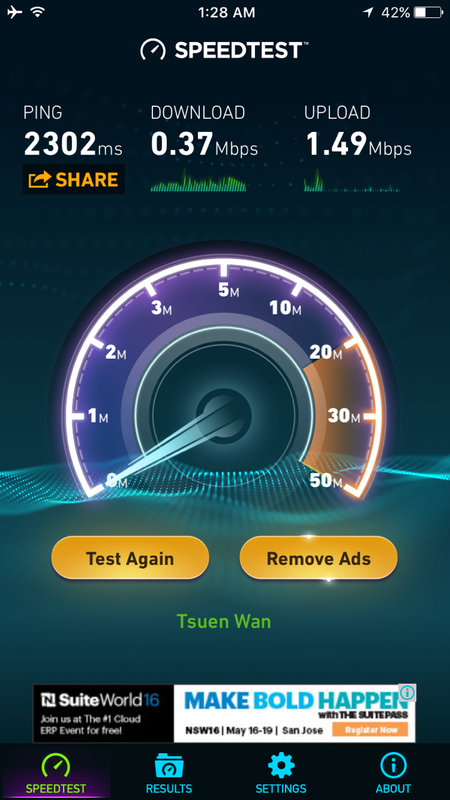 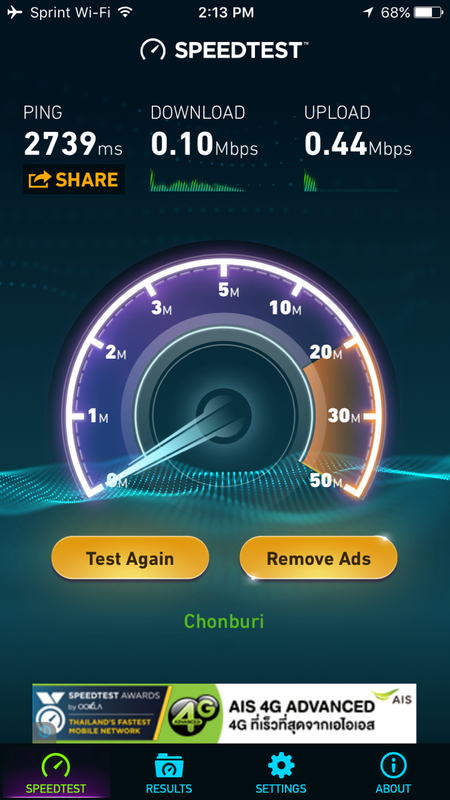 I gave it a try but the speeds were extremely slow even though only 6 other passengers were using it. 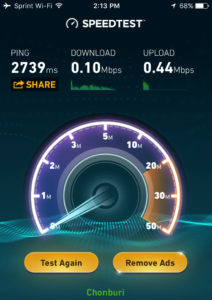 It was enough to be able to use iMessage and email but poor for web browsing. 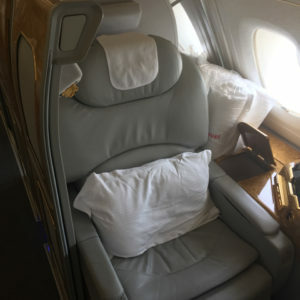 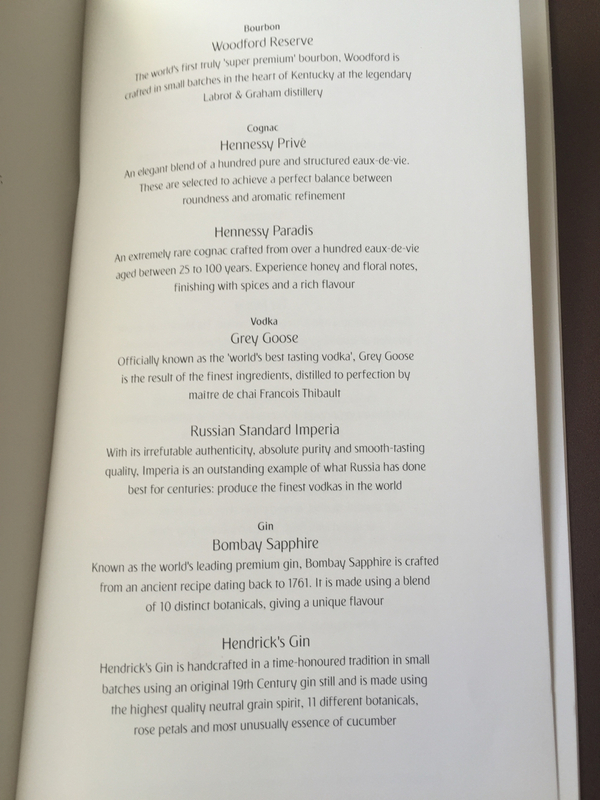 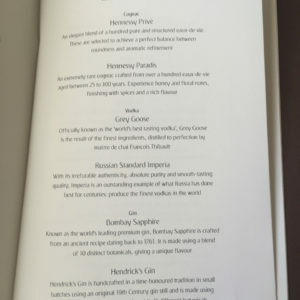 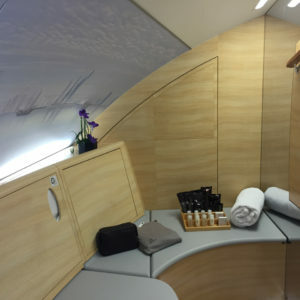 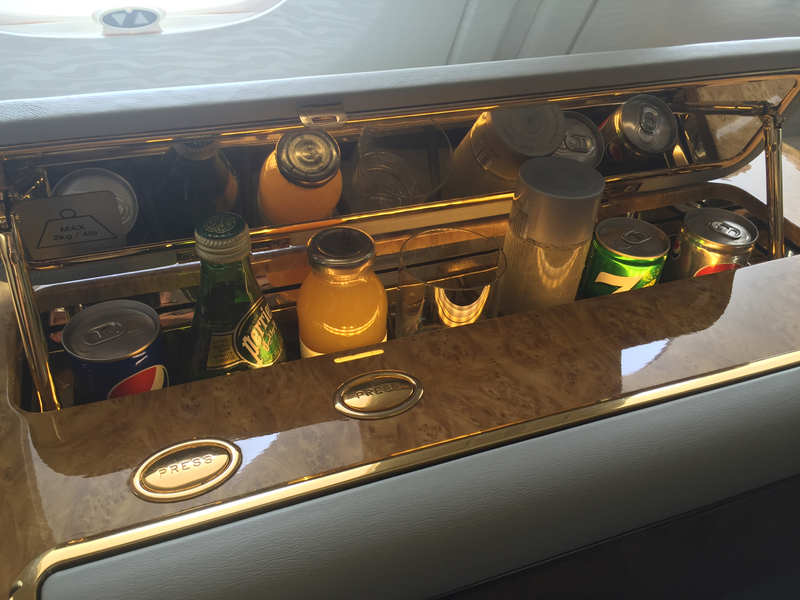 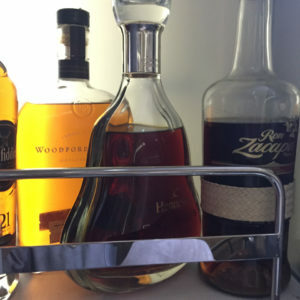 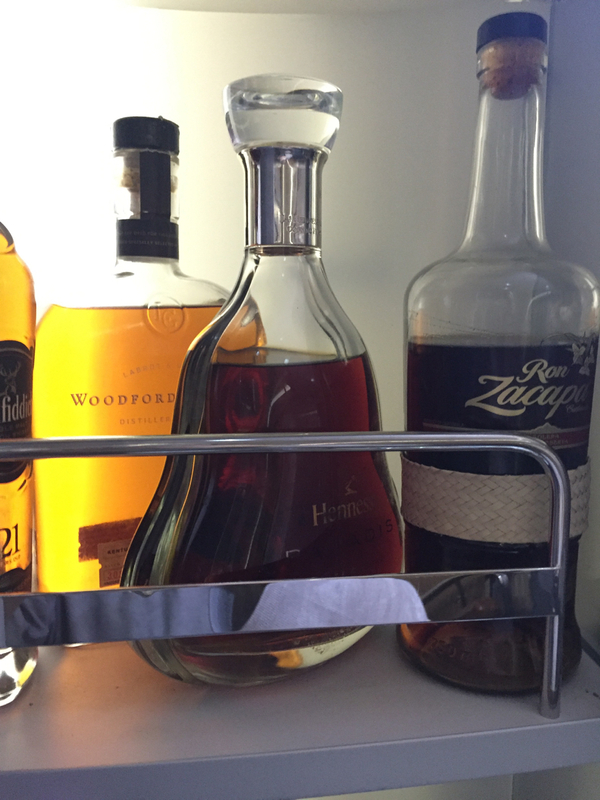 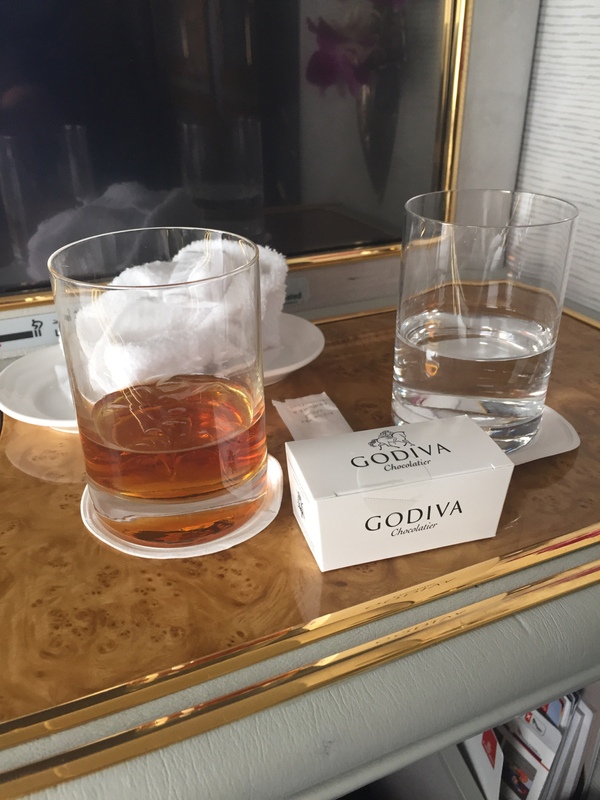 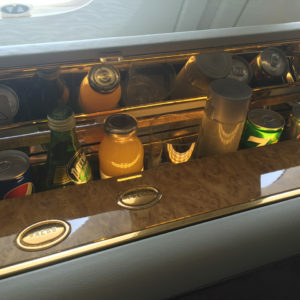 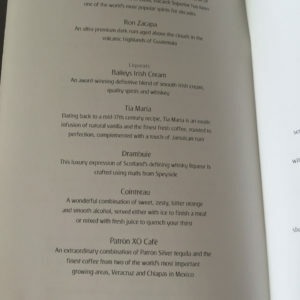 With only 1 other passenger in First Class the service was perfect but I could of always helped myself to the mini bar located inside my suite if I got thirsty! 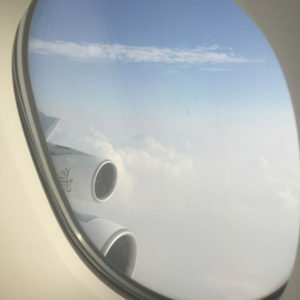 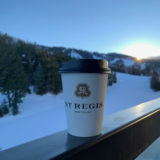 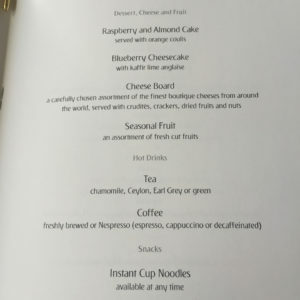 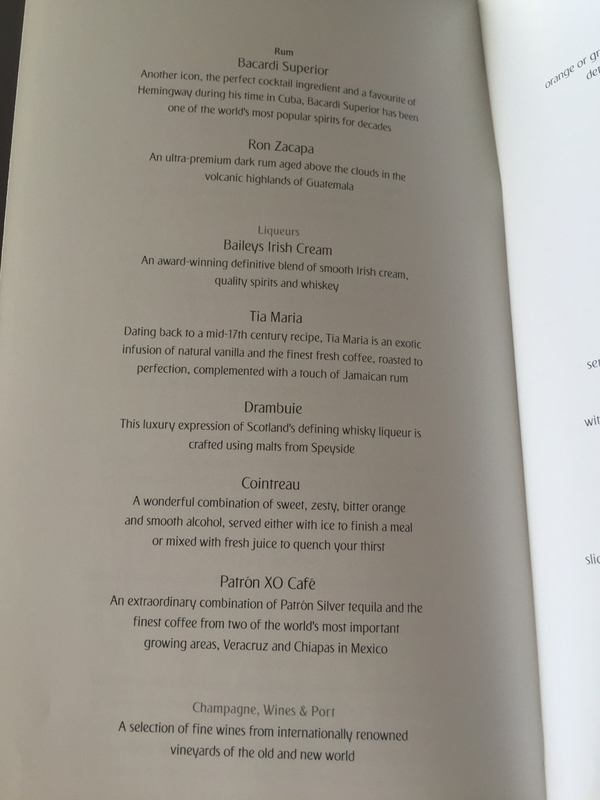 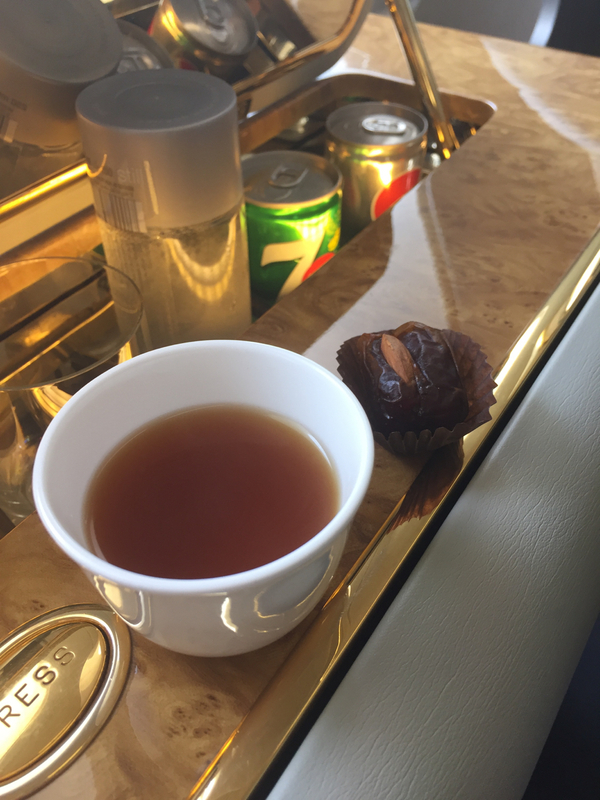 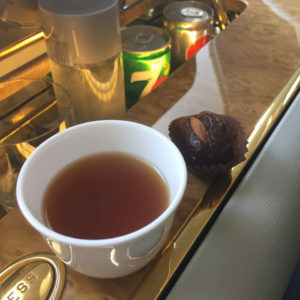 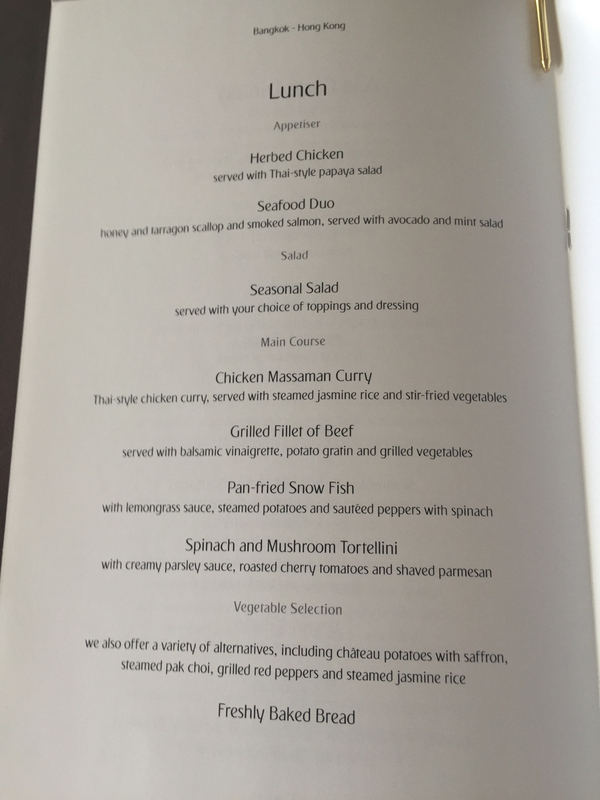 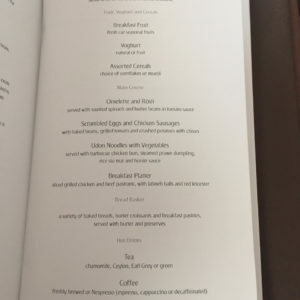 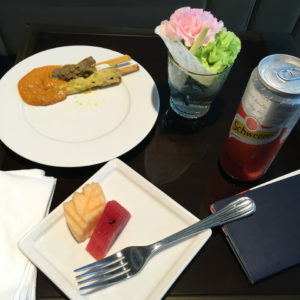 The flight was a short 2 hours so I couldn’t fully enjoy all the amenities but it was a great way to get my bearings before my long haul from Hong Kong to Dubai. 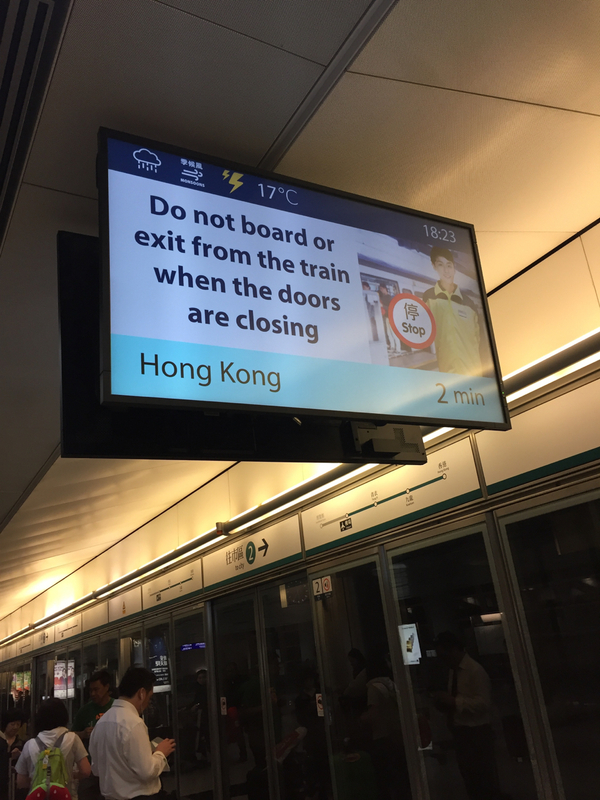 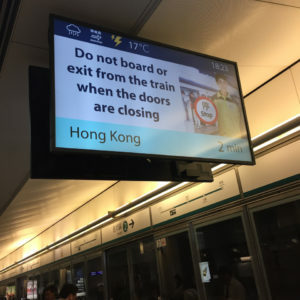 We landed into Hong Kong on time despite it being extremely stormy in the area which the train TV screen reported Monsoons as the current weather. 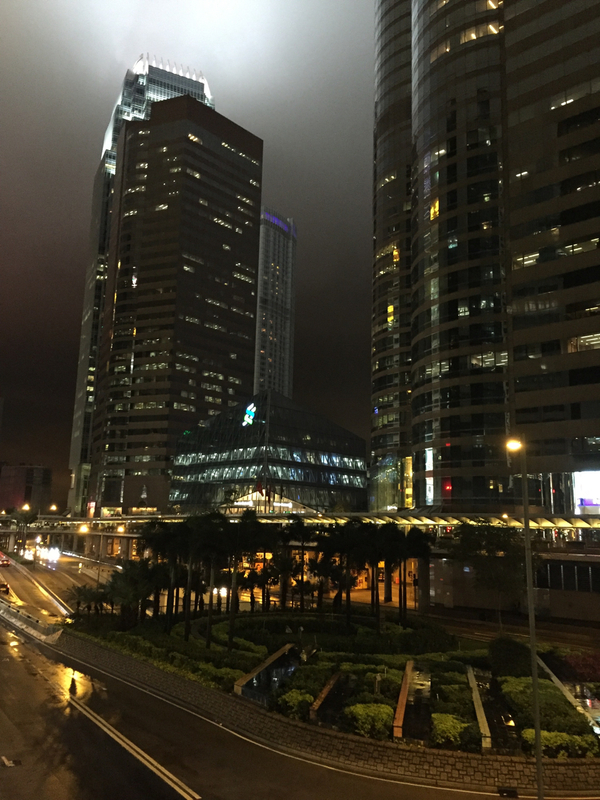 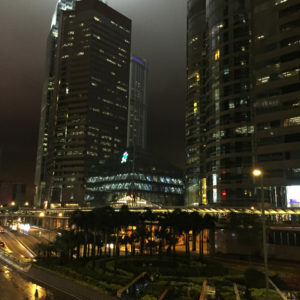 During my 7 hour layover, I explored Hong Kong for a few hours despite the horrible weather by taking the express train into the city from HKG. 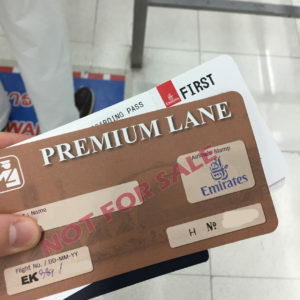 I redeemed my PYE coupon I received while flying Cathay Pacific First Class earlier this year at their Central store which I was only able to get a t-shirt with the HKD 500 coupon plus USD 10 cash. 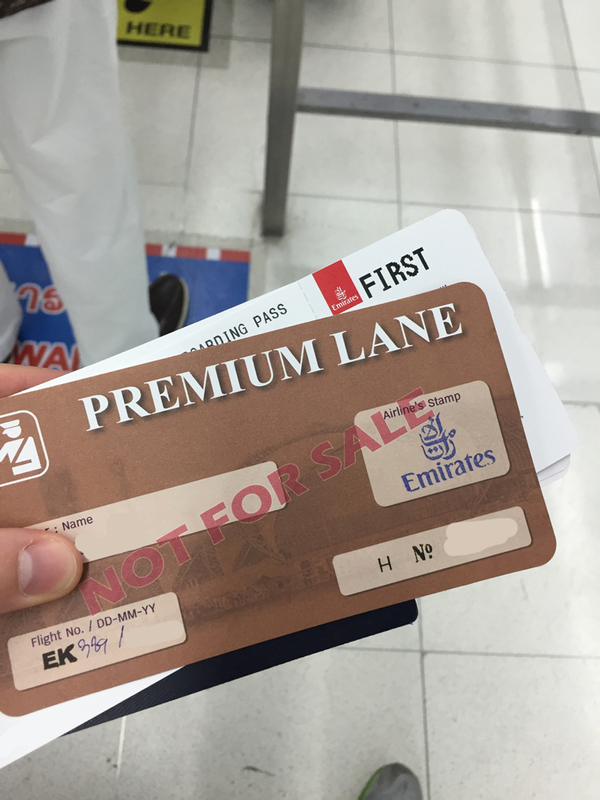 PYE is not my type of store at those prices. 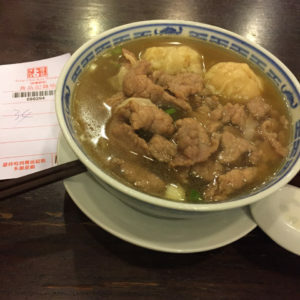 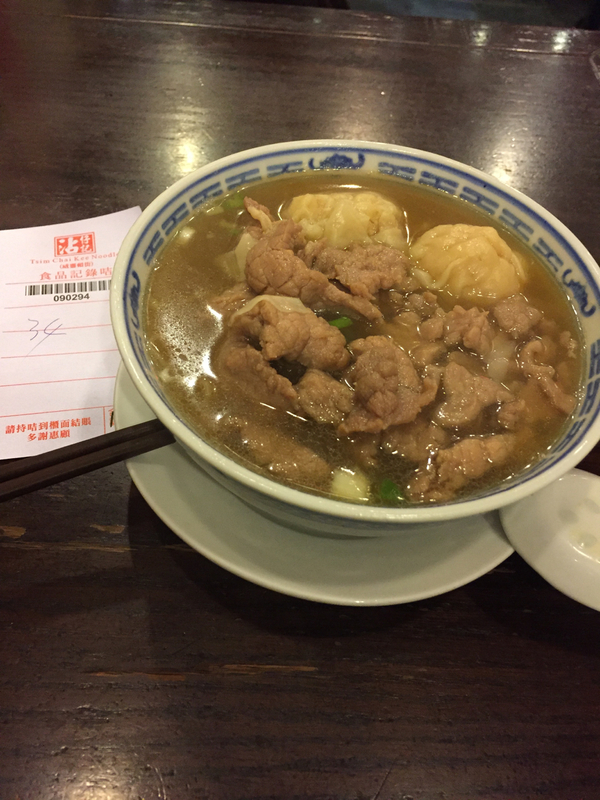 Being in Hong Kong I had to grab a wonton soup at Tsim Chai Kee Noodle which is cash only but well worth the hassle of obtain cash from an ATM. 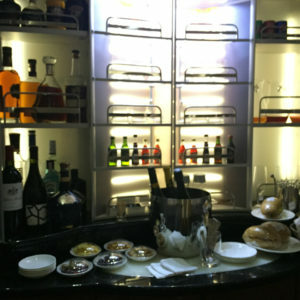 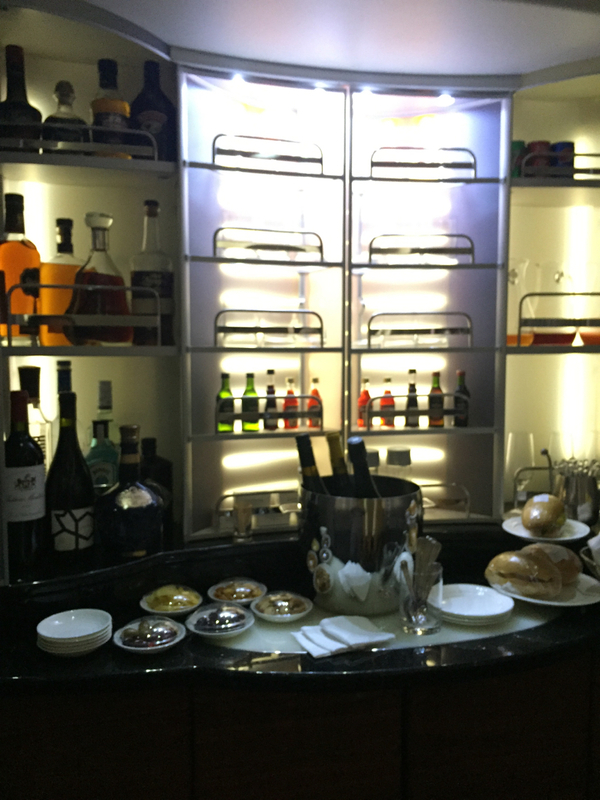 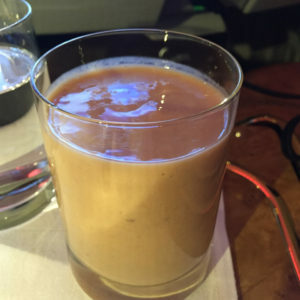 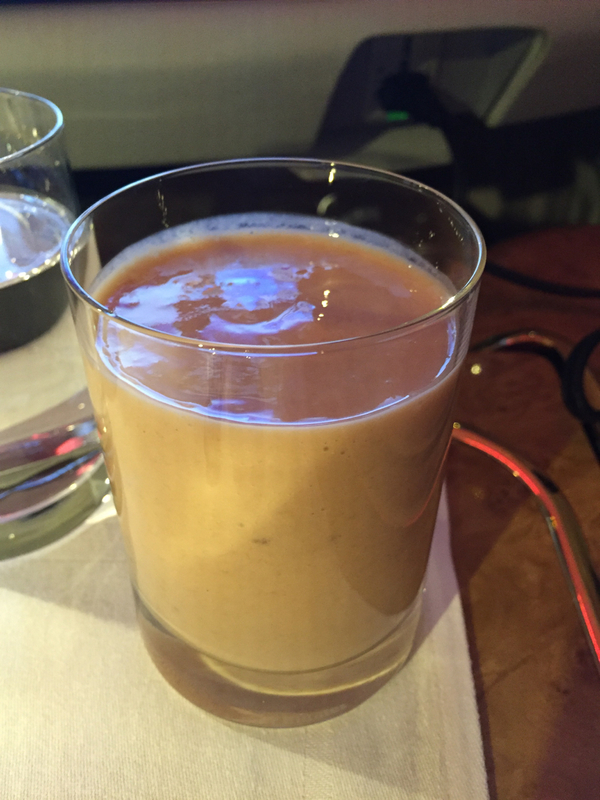 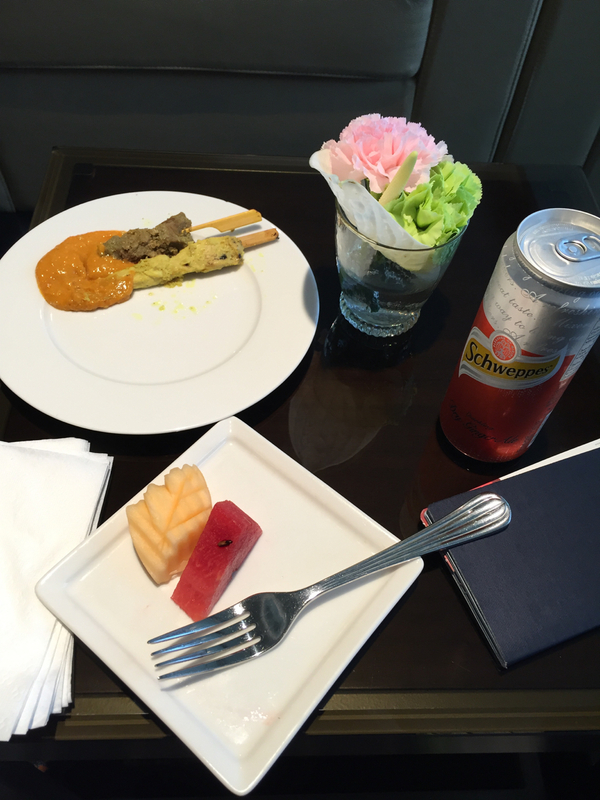 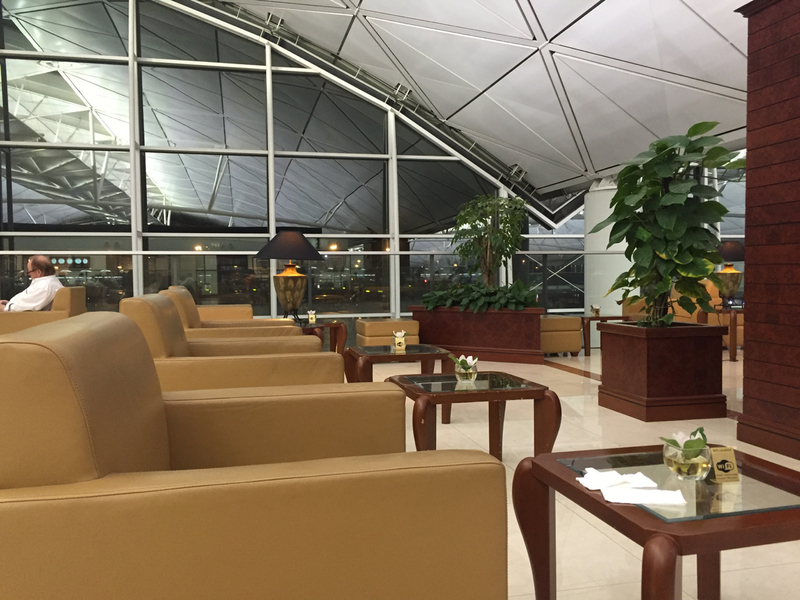 Next I headed over to LKF for a few drinks then headed back to the airport to go to the lounge prior to my flight. 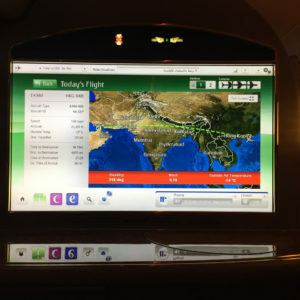 My flight to Dubai boarded just before midnight with a 12:35AM departure which proved to be a busy time at HKG. 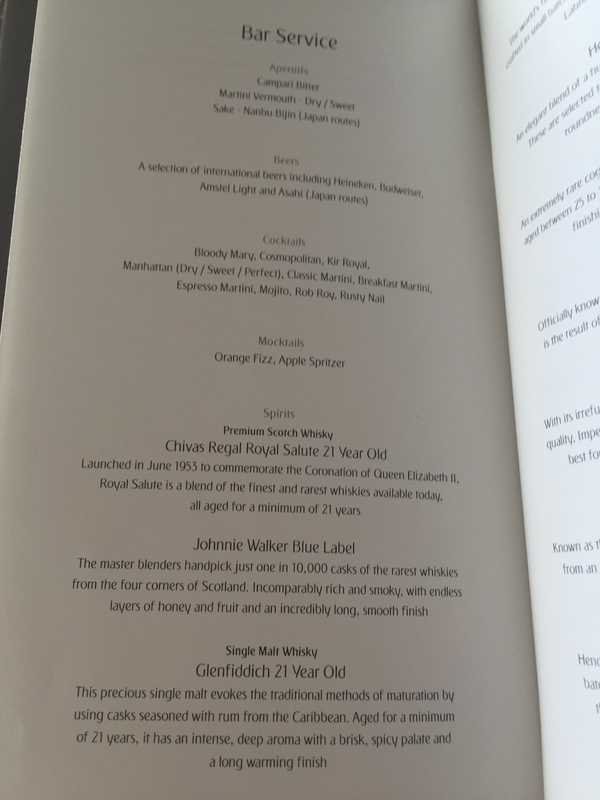 I noticed First Class was full on this flight as I got situated in my seat, 2K. 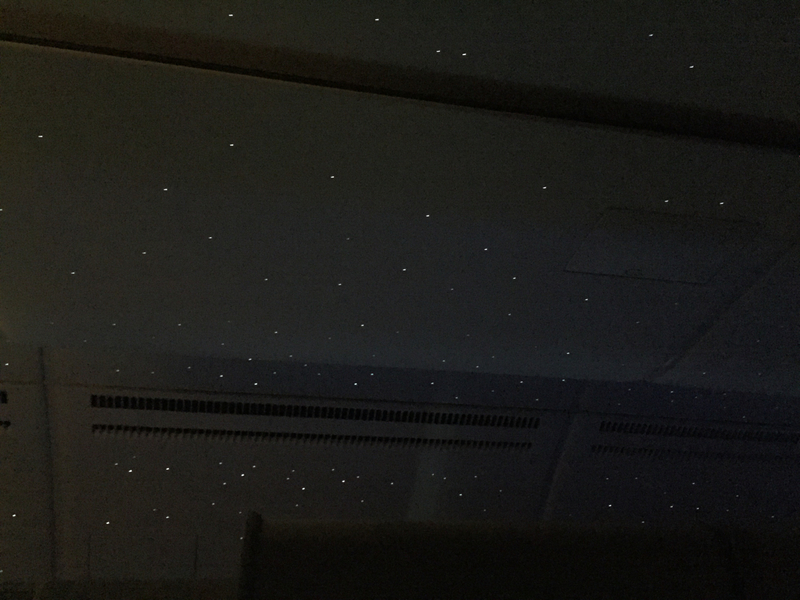 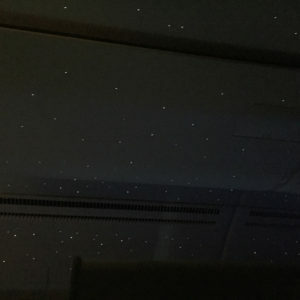 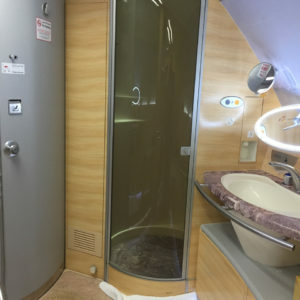 When the flight attendant came around I immediately booked the shower as I wanted to freshen up prior to sleeping during the flight. 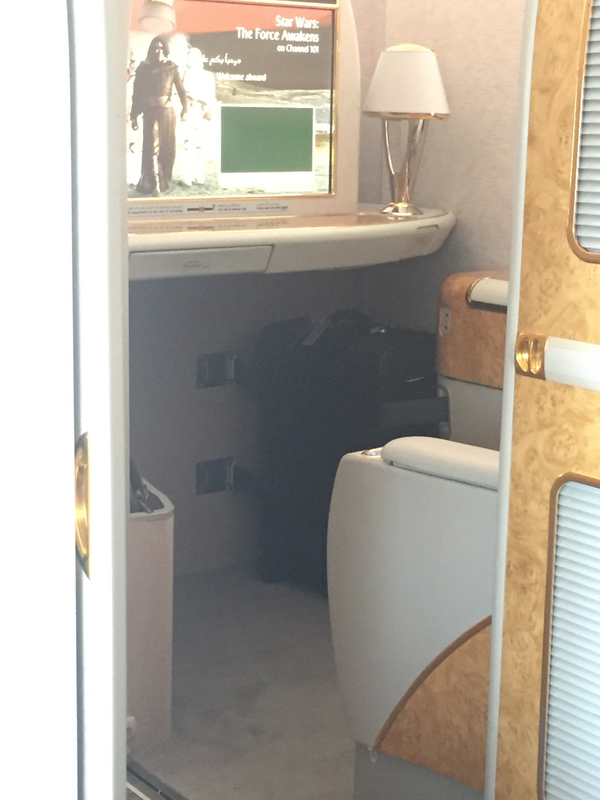 The last flight was too short to take a shower and my next flight was going to be operated by a B777-300ER. 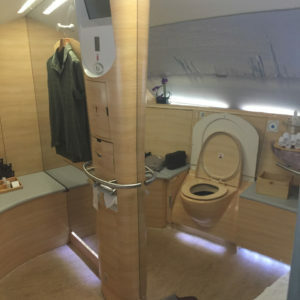 About 30 minutes after takeoff I was informed the shower was ready. 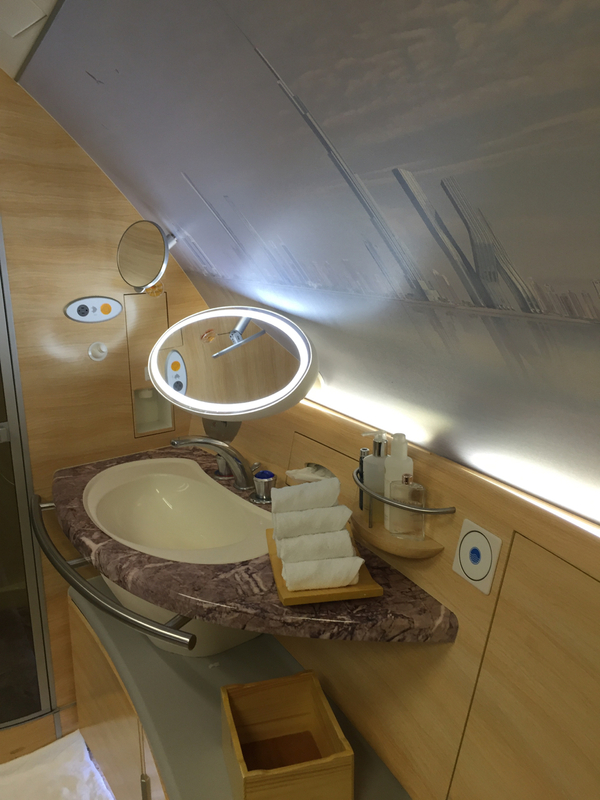 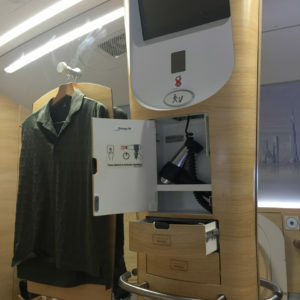 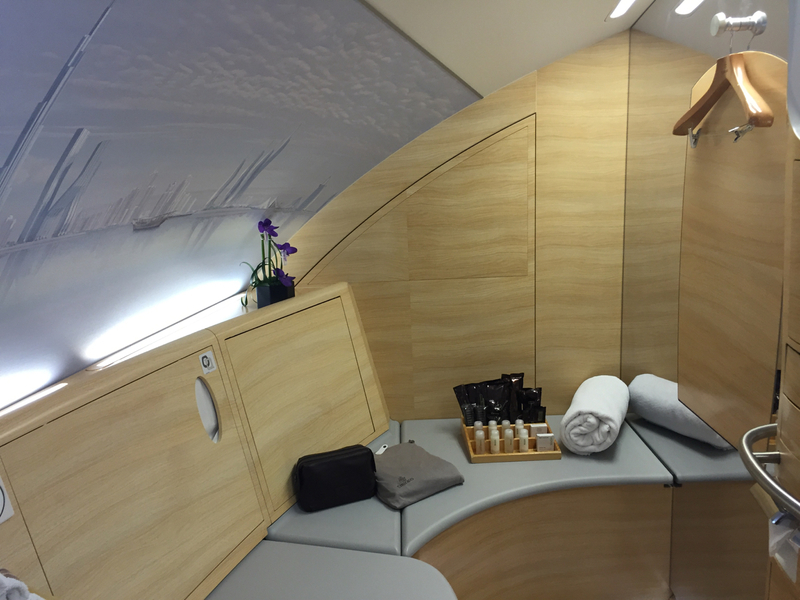 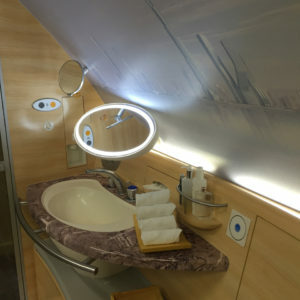 After flying Etihad Apartment Class a month prior it wasn’t my first inflight shower but I immediately noticed how much larger the bathroom was on this Emirates A380. 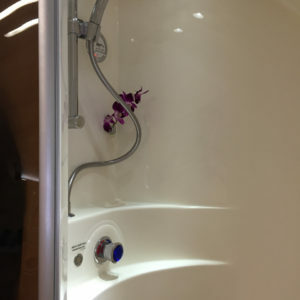 The shower was roughly the same size along with the same 5 minute water time limit. 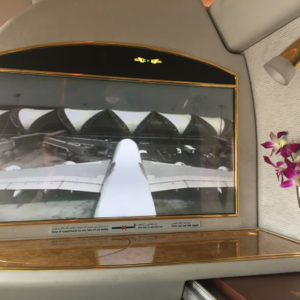 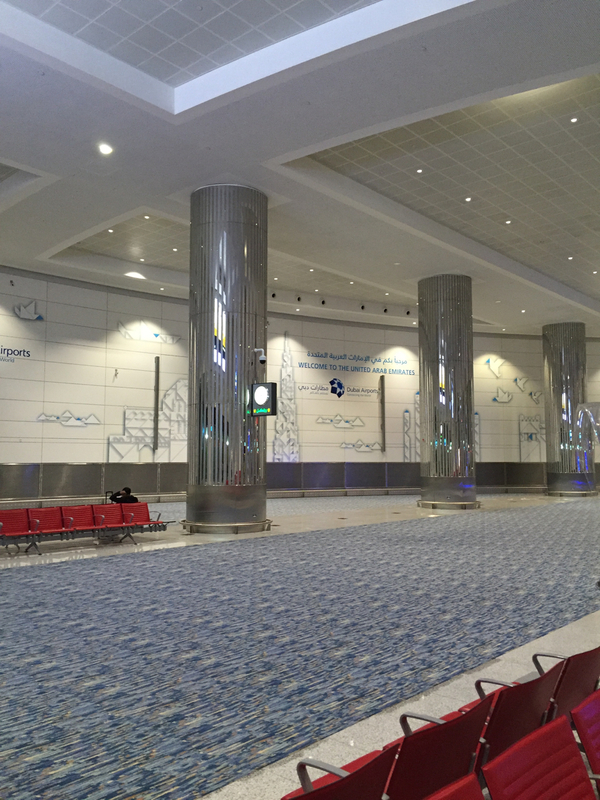 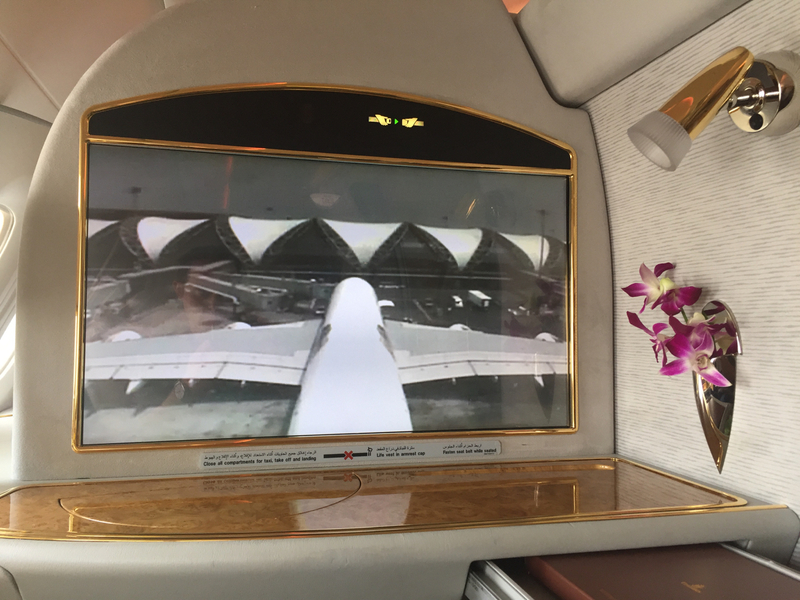 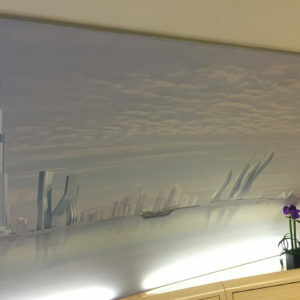 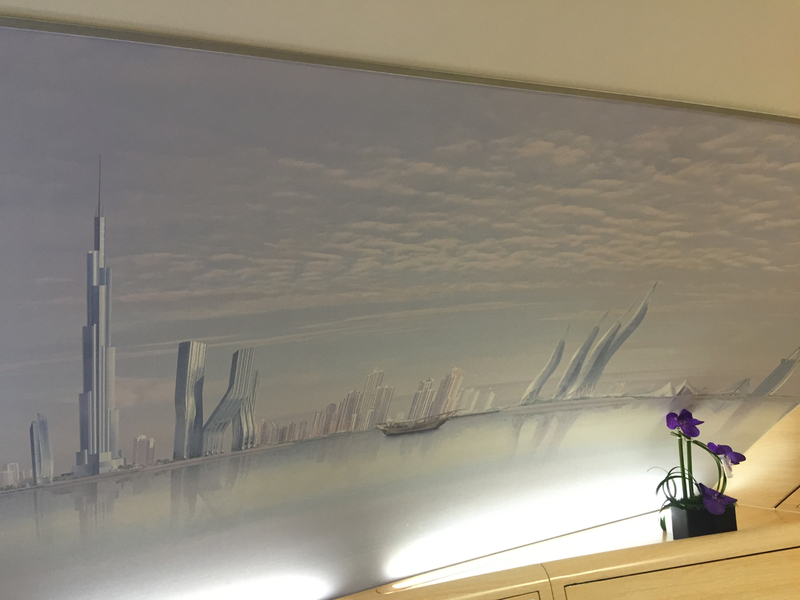 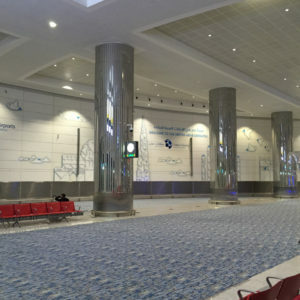 Unique to Emirates is a skyline of Dubai as the wallpaper, a heated floor plus a TV. 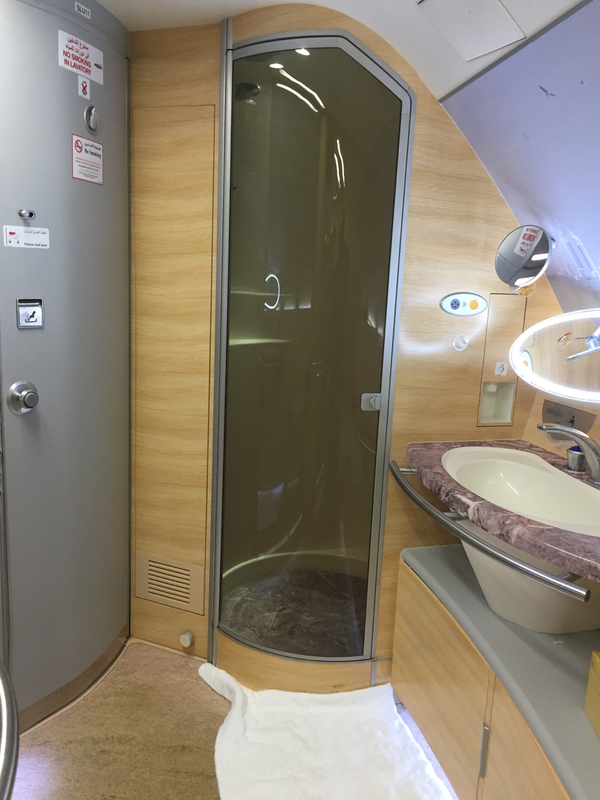 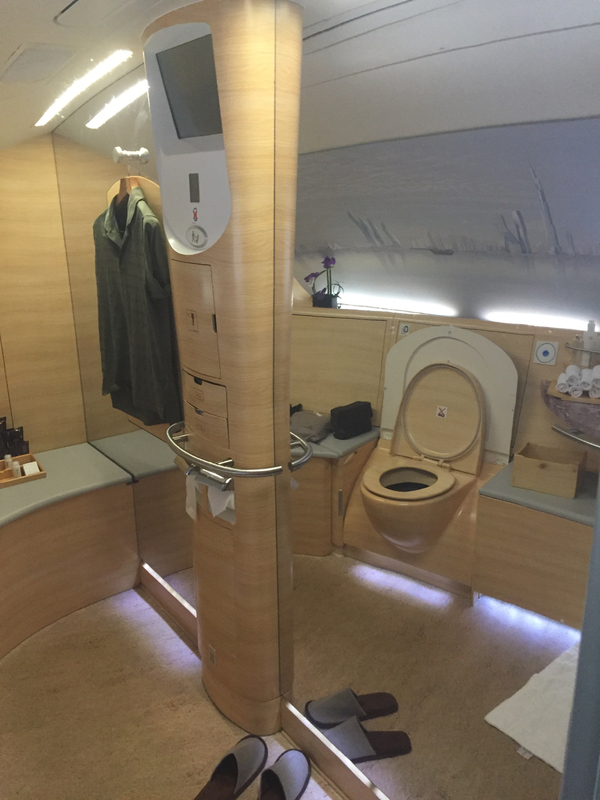 It’s the largest inflight shower suite I’ve ever been inside. 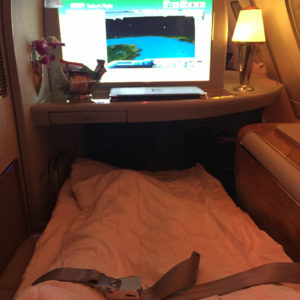 While I was showering the flight attendant made my bed to so I immediately fell asleep for 6 hours. 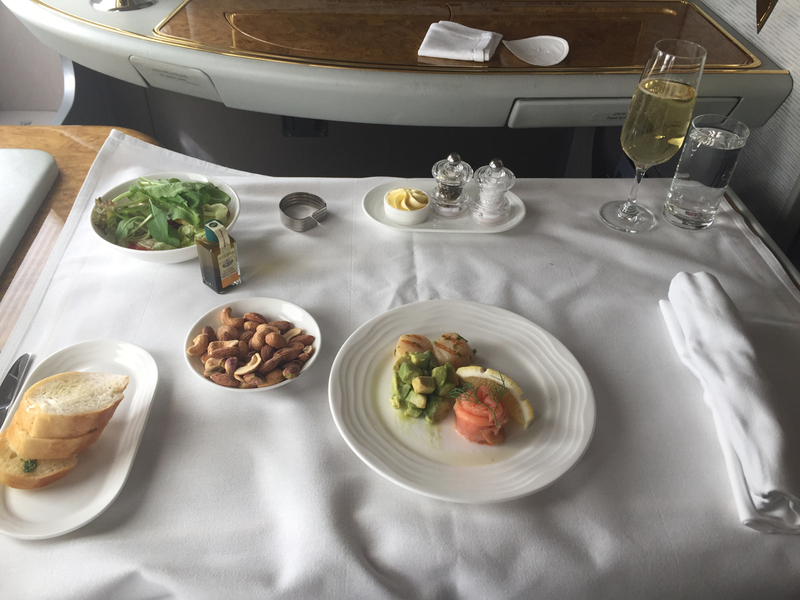 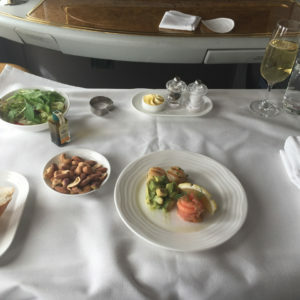 I was woken up for breakfast prior to landing into Dubai. 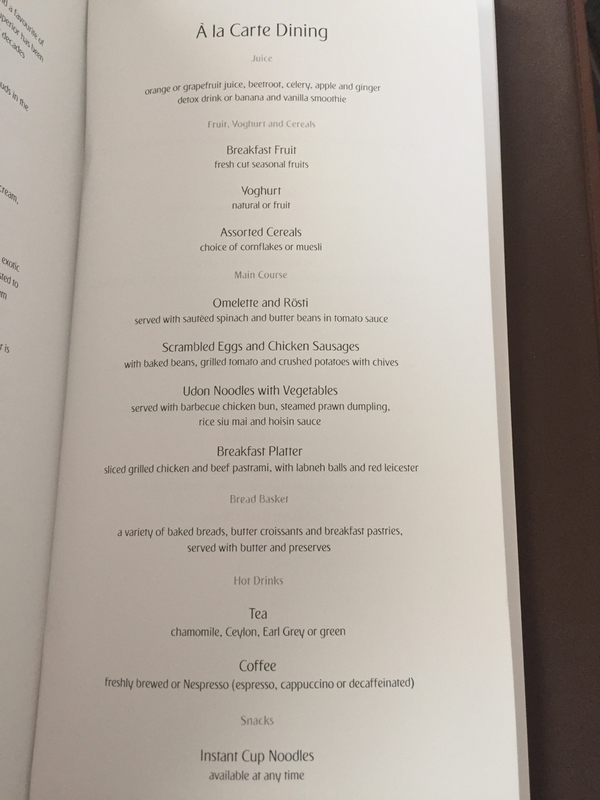 For breakfast I opted for the asparagus omelette, prawn salad and a smoothie. 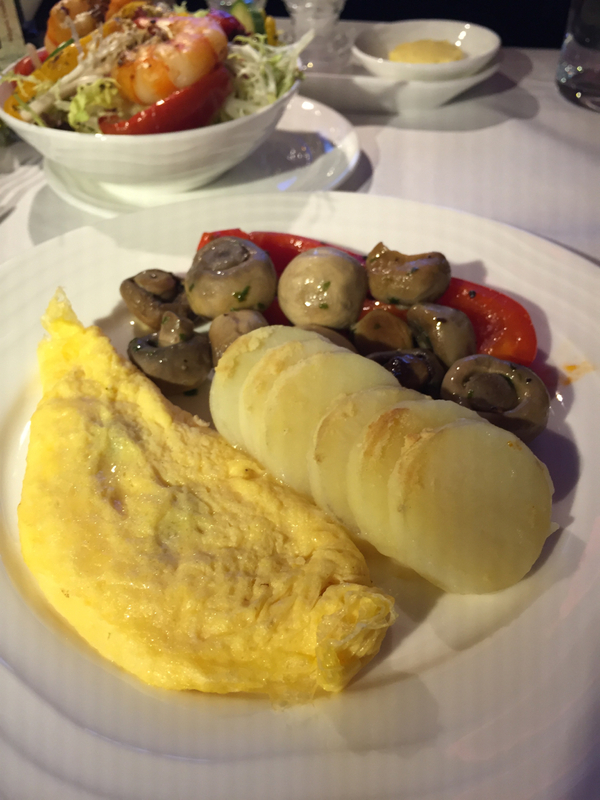 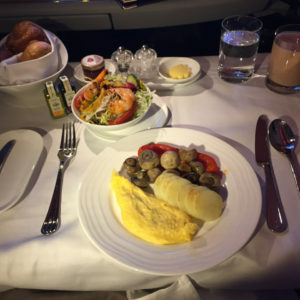 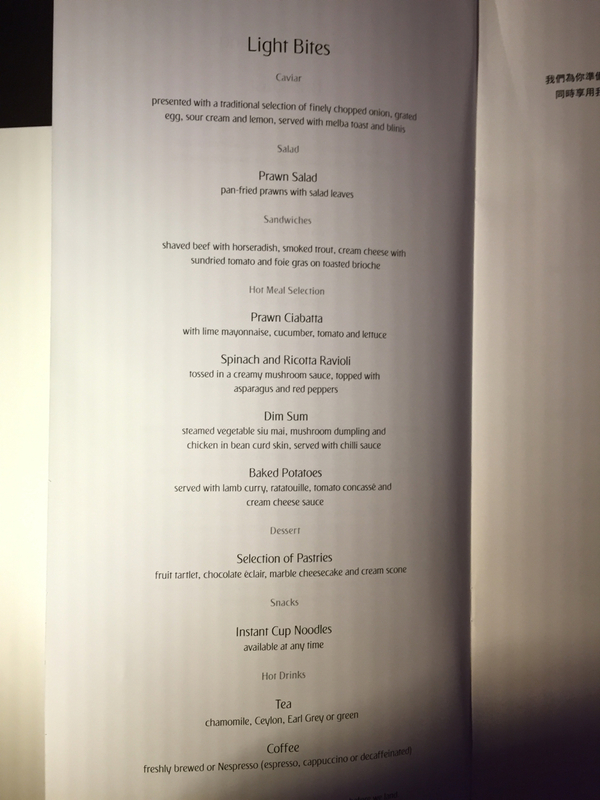 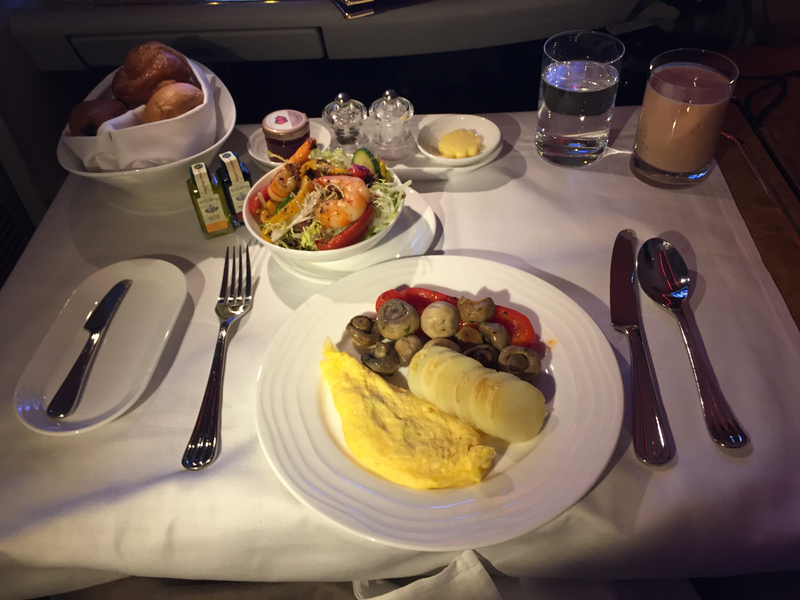 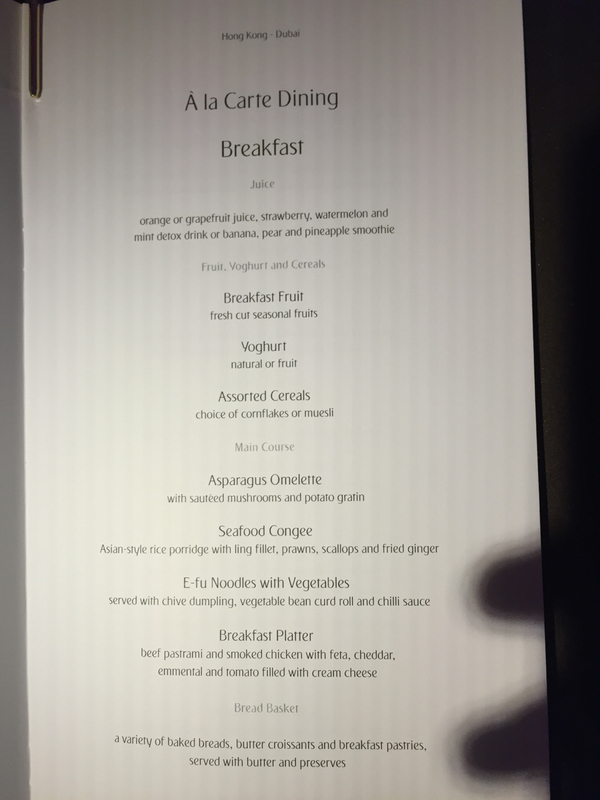 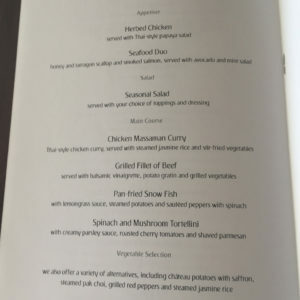 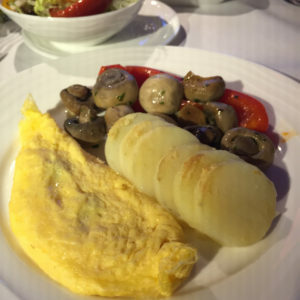 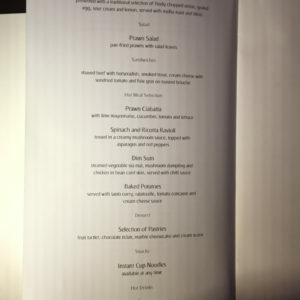 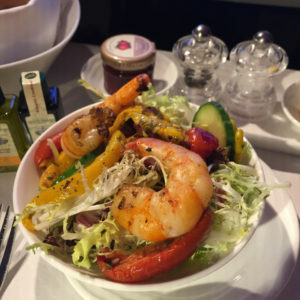 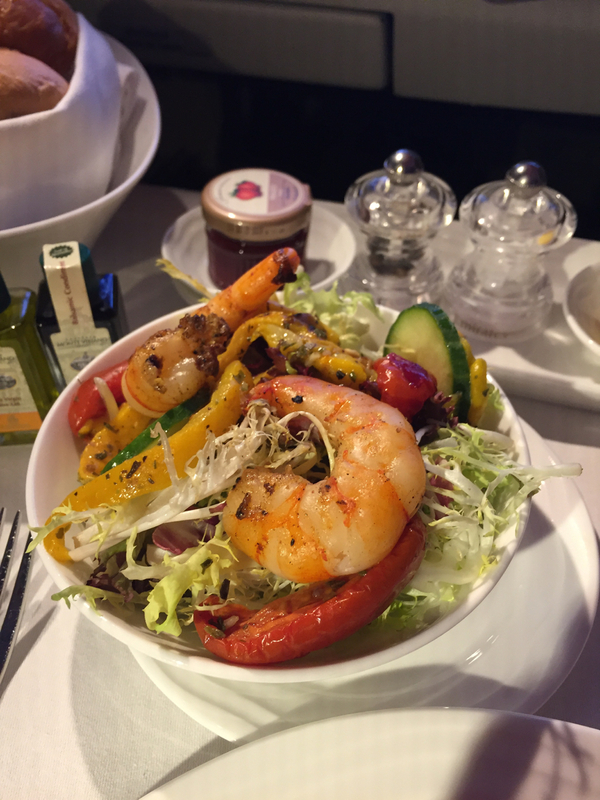 The food was again very tasty and I was very satisfied upon landing into Dubai. 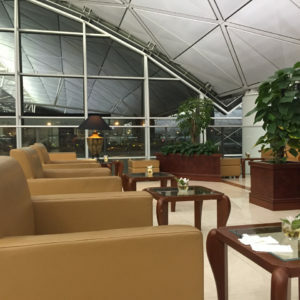 I now had a 21 hour layover prior to my next flight. 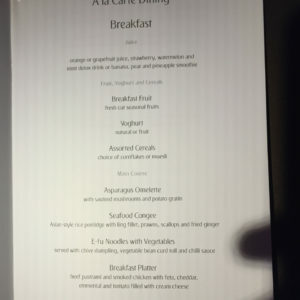 The service on this leg was OK. 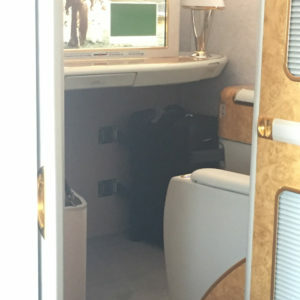 I was denied access to the restroom while landing as the restrooms was stuffed with blankets and pillows. 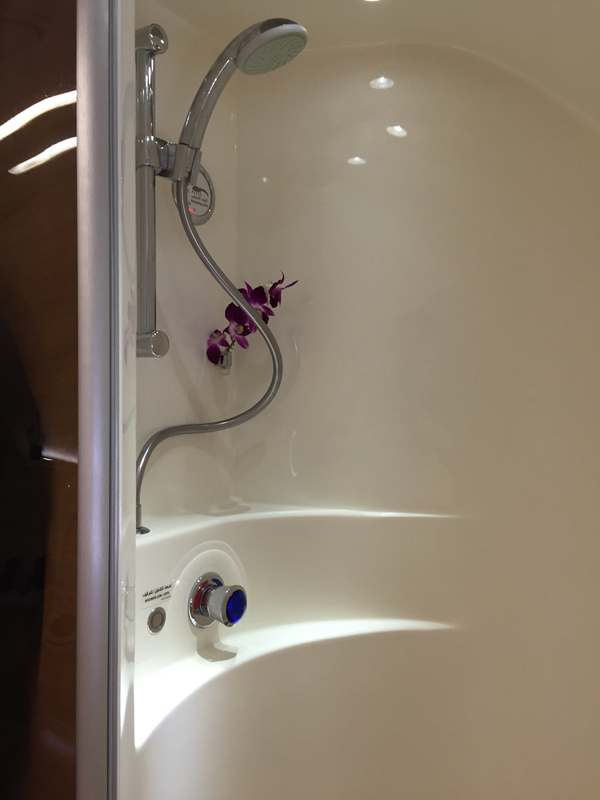 Immediately after parking at the gate I was able to use the shower suite bathroom. 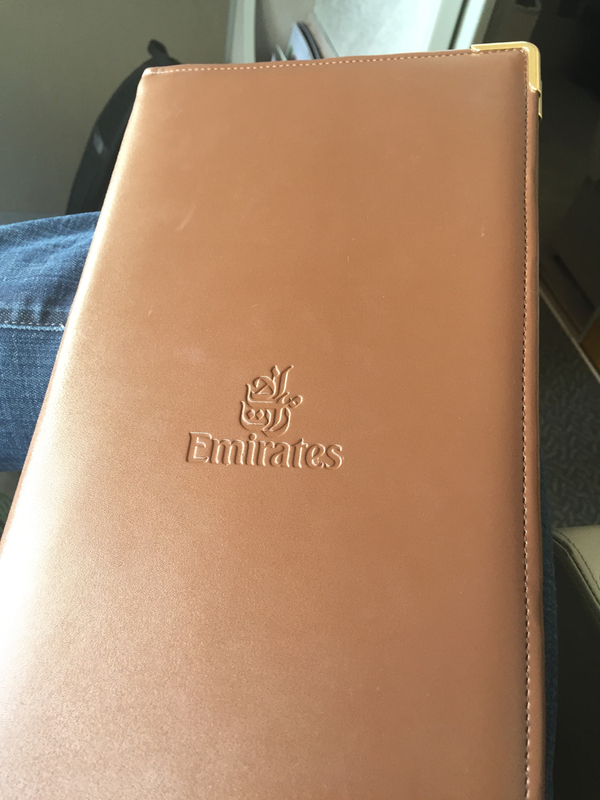 Stay tuned for what I did during my long layover as well as my flight on their B777-300ER from Dubai to Dallas (16 hours).